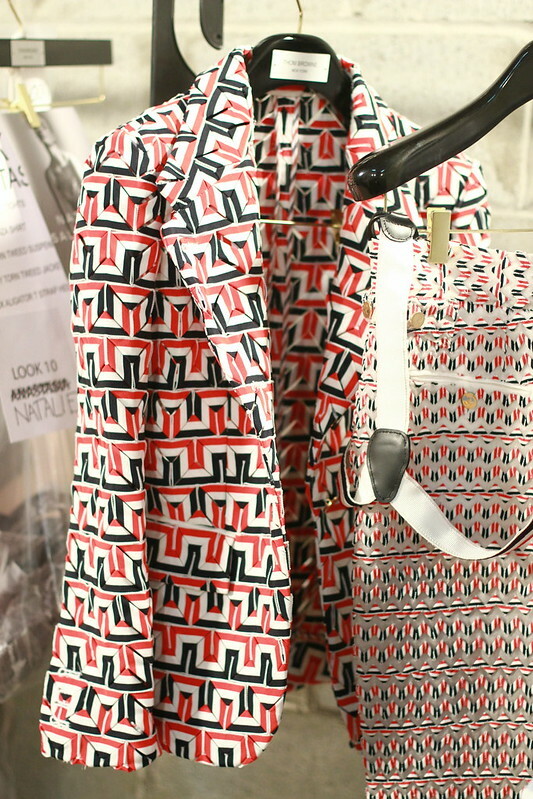 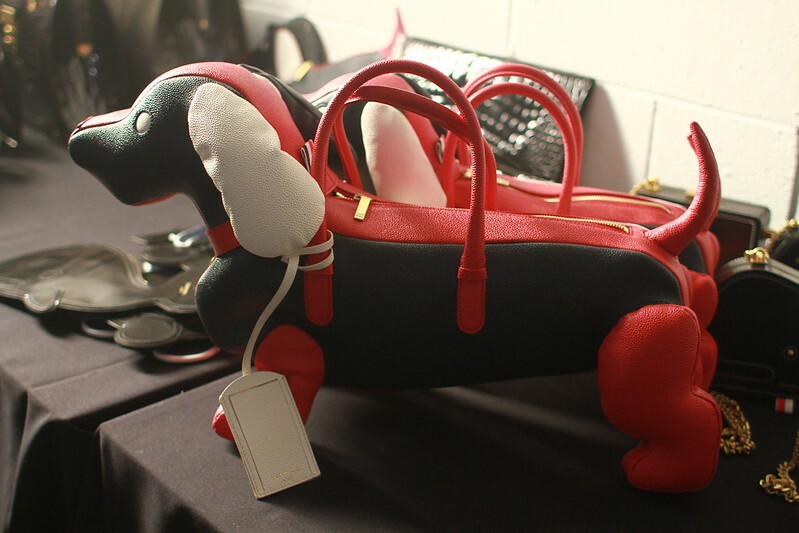 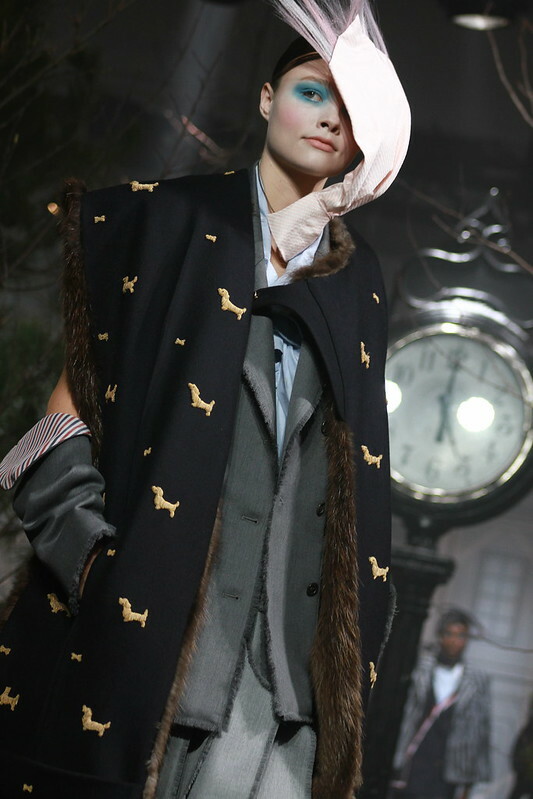 See the full album of Fall/Winter 2016 Sneak Peeks here. 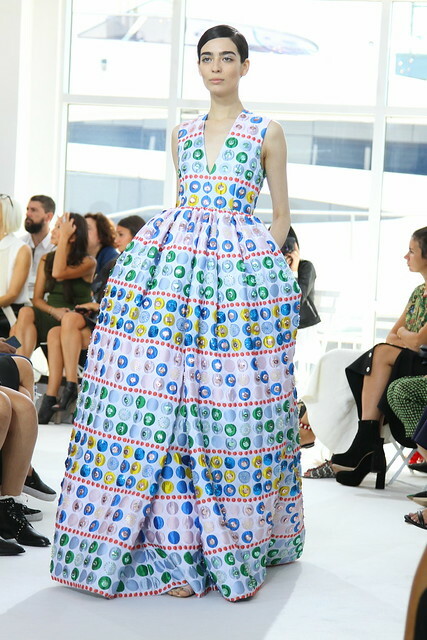 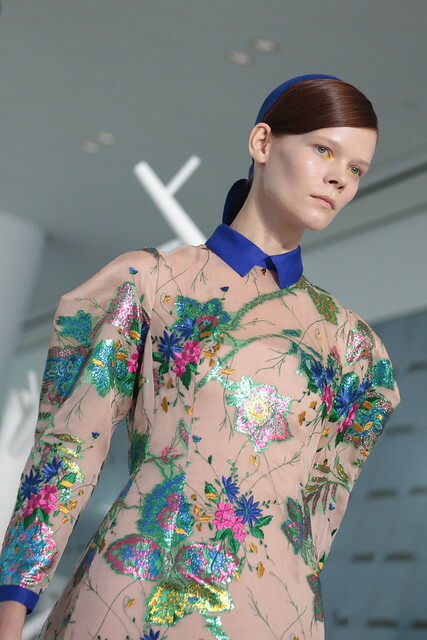 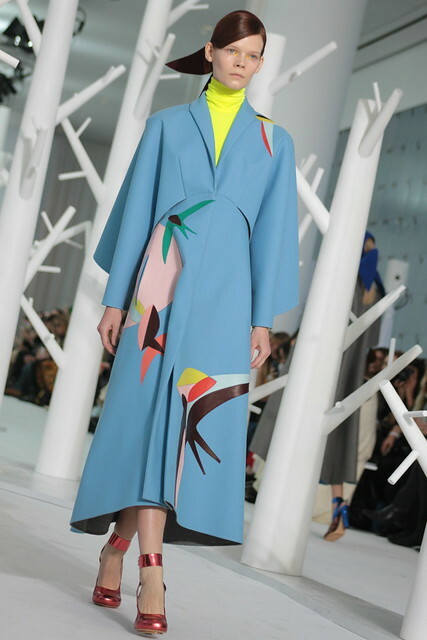 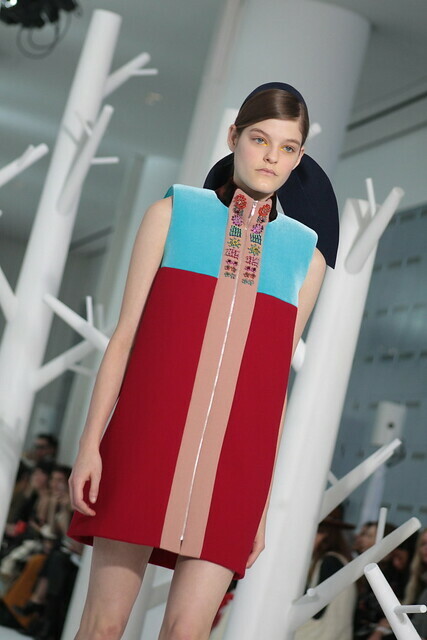 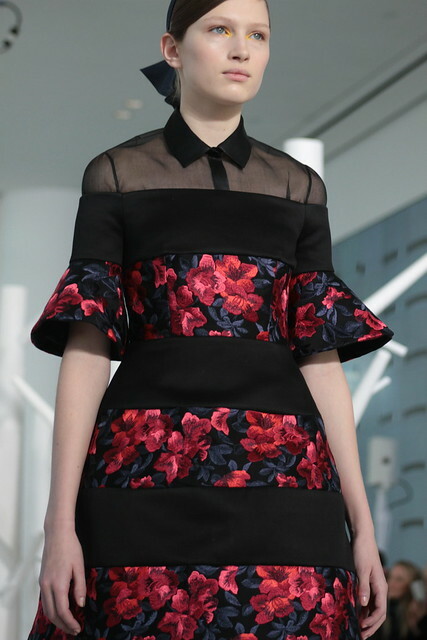 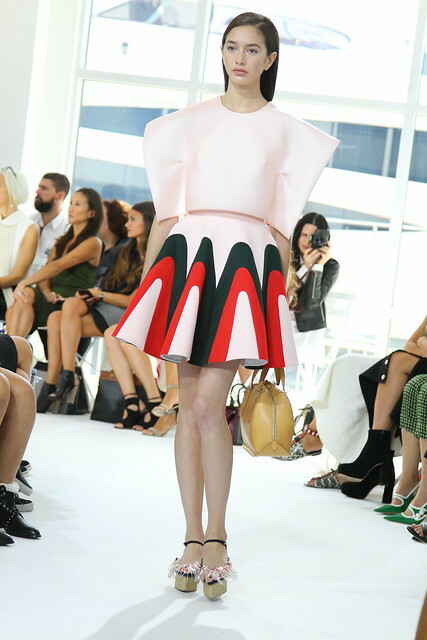 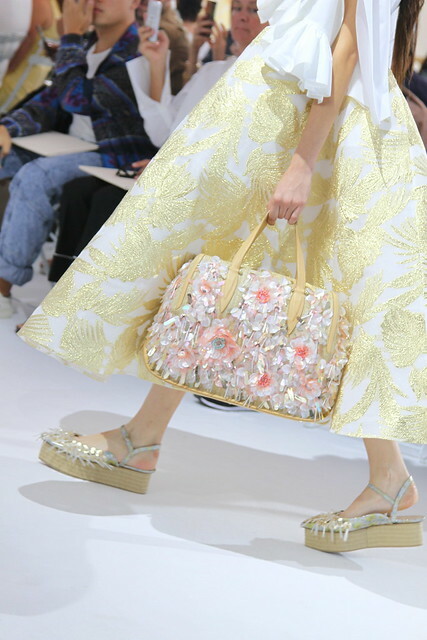 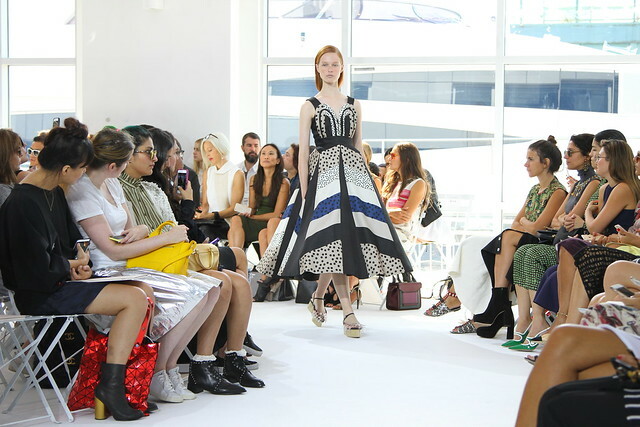 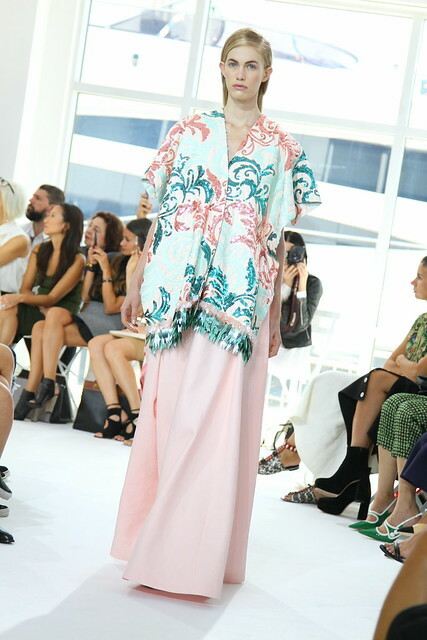 DELPOZO is a brand that almost seems as if it would be more suitable to show at Paris fashion week. 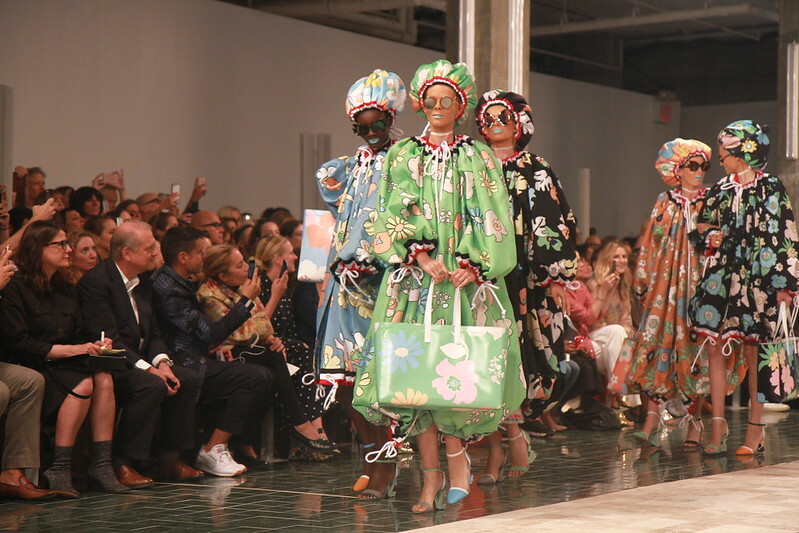 Frequently referred to as “demi-couture”, the brand’s epic, handmade collections are the highlight of my every NYFW, and the perfect way to end the frenzy of each season. 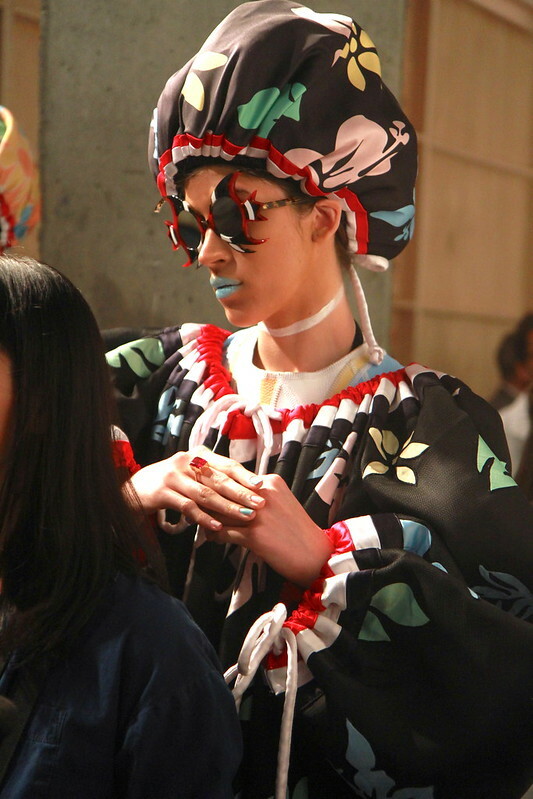 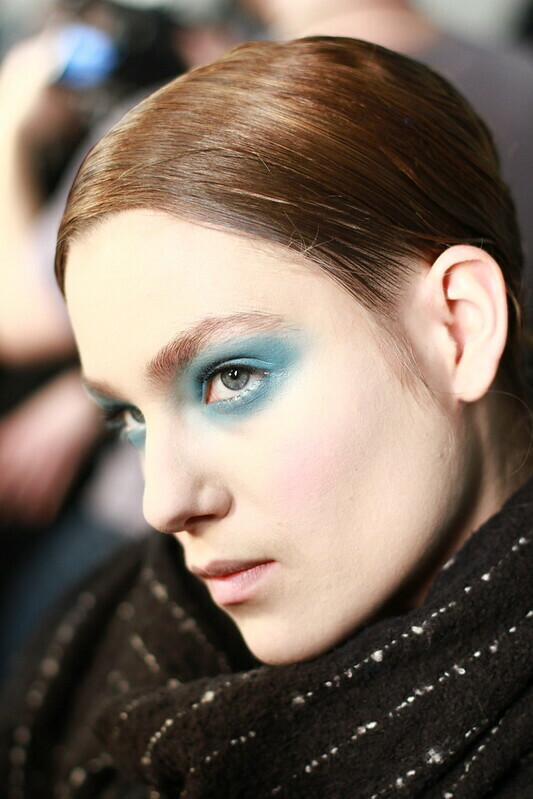 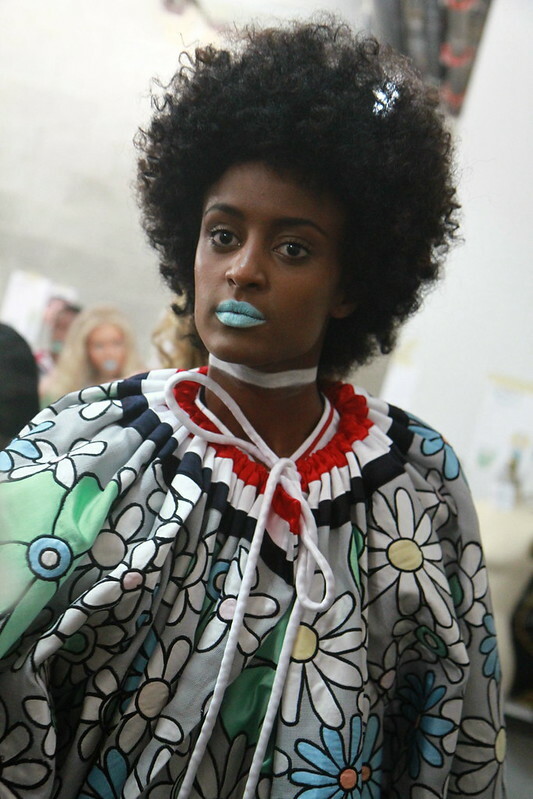 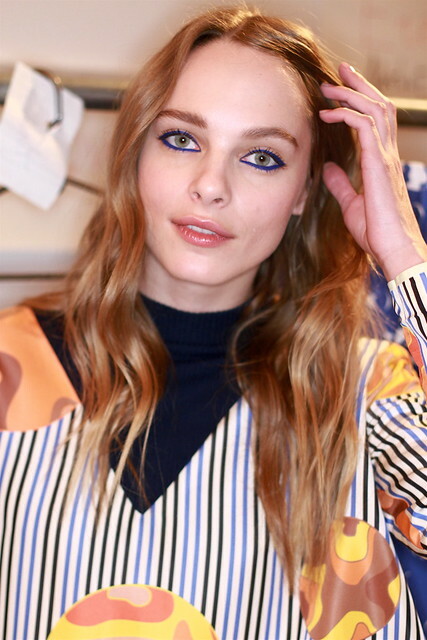 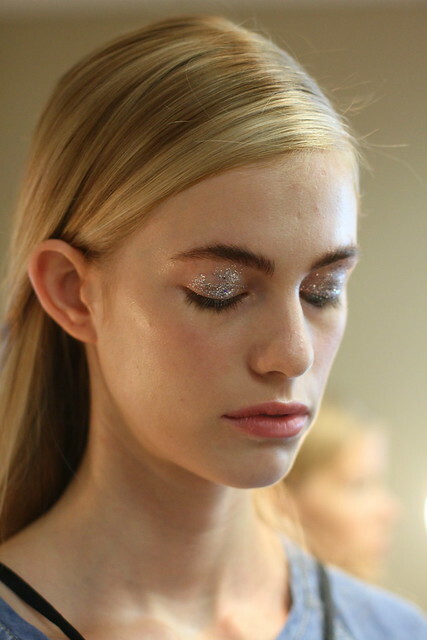 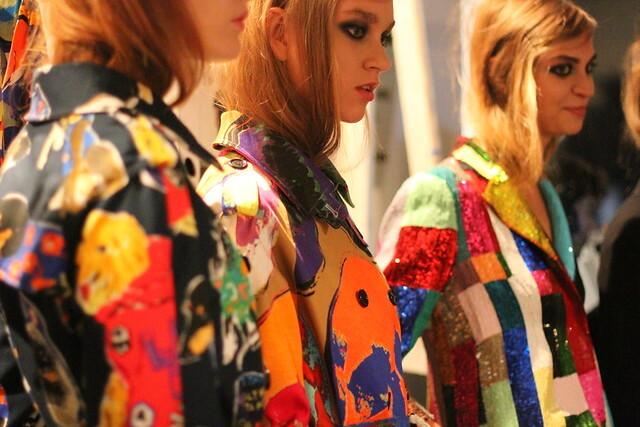 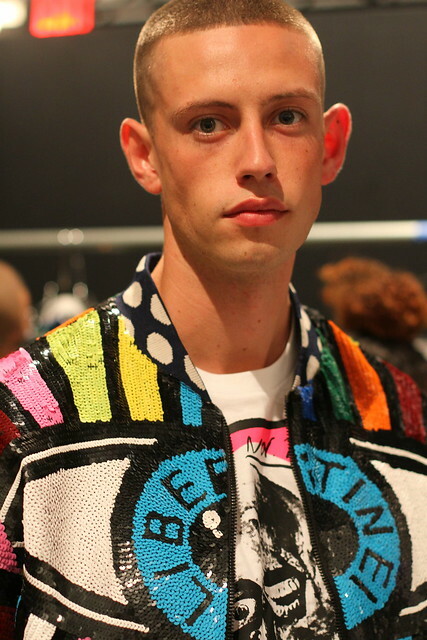 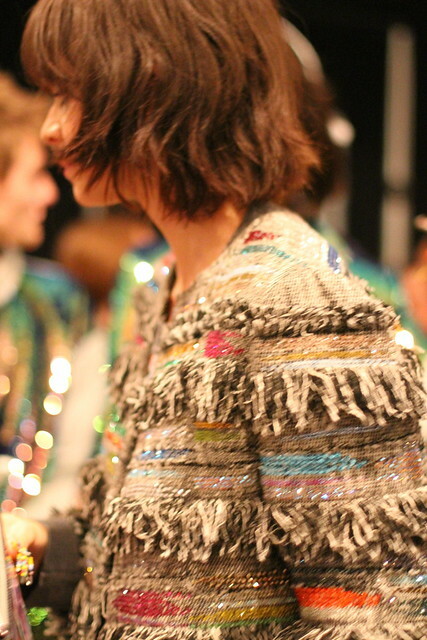 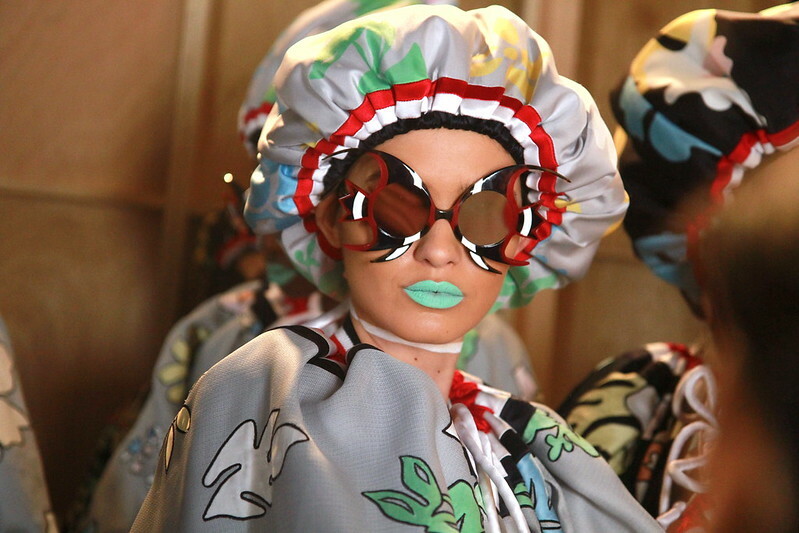 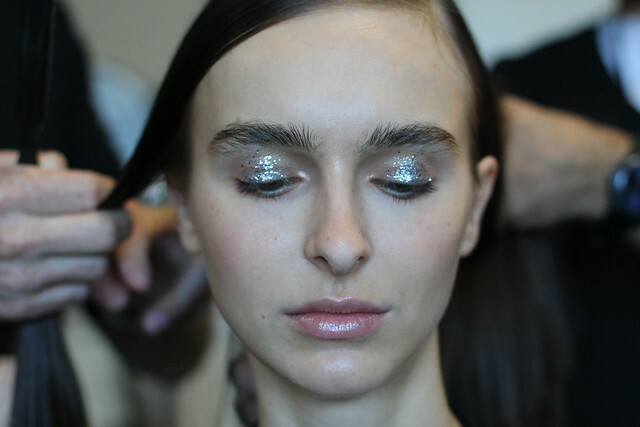 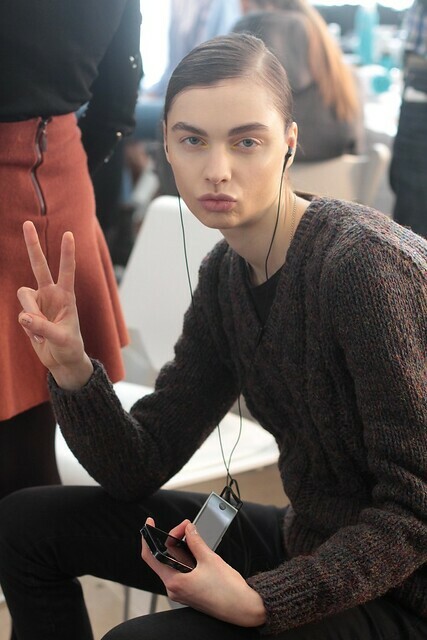 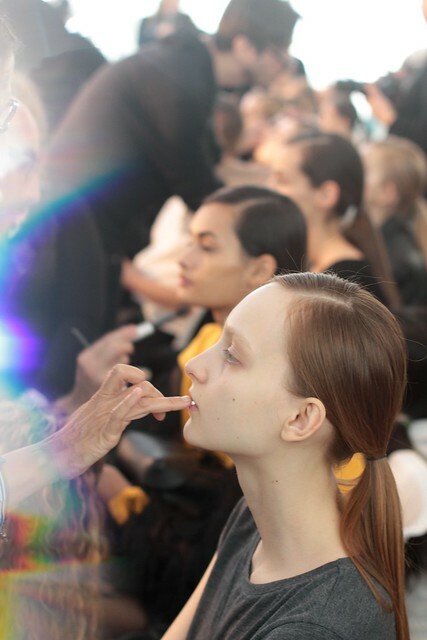 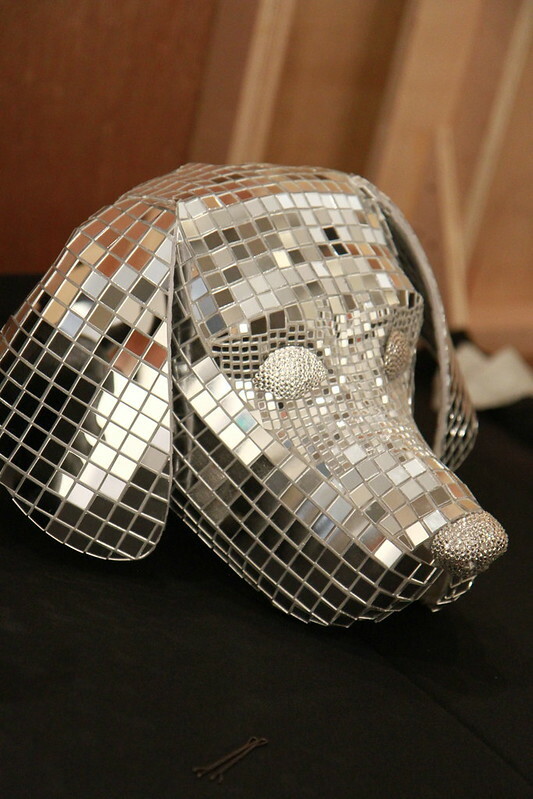 Backstage, the look was all about a fresh face topped off with glitter eyes, and ultra-long, sleek hair. 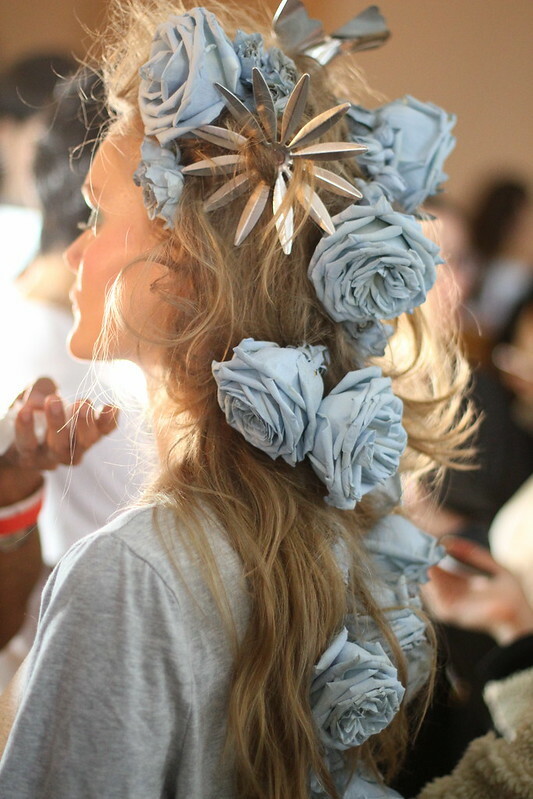 Moroccanoil Creative Director Antonio Corral Calero created a very long, easy hairdo, with a twist– literally! 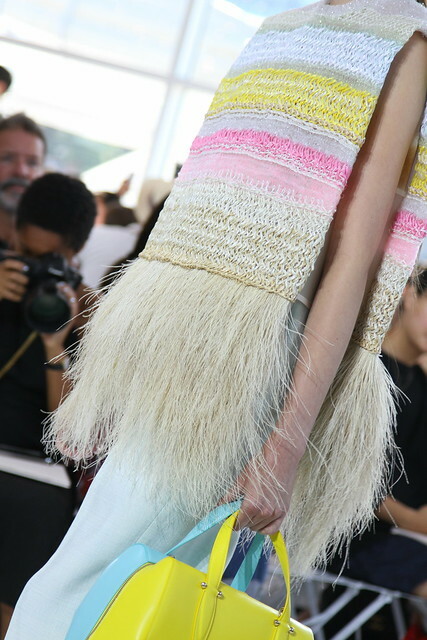 Hair featured a small, twisted ponytail in the center. 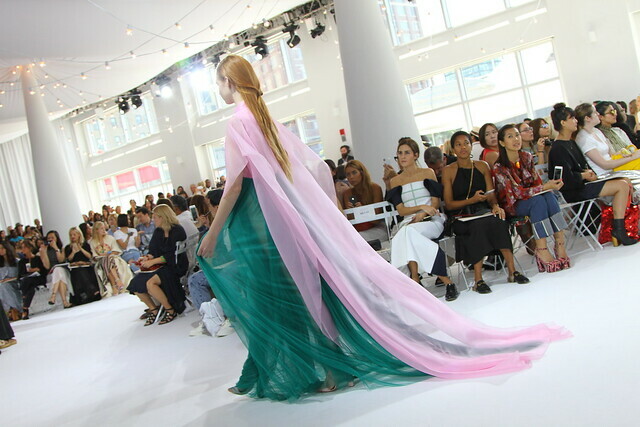 Apply 22-24″ extensions, for hair that is not naturally long. 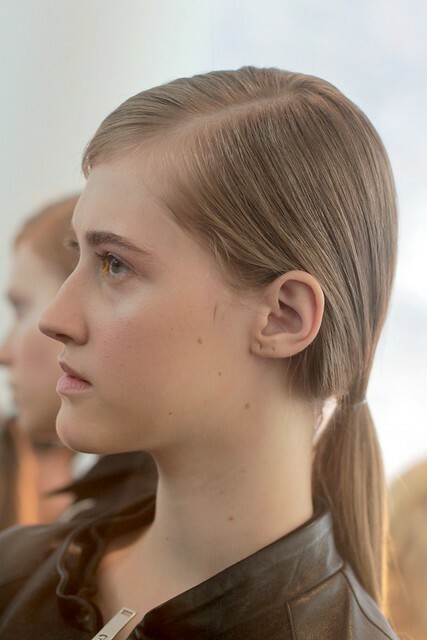 Starting with damp hair, apply Moroccanoil Treatment and Moroccanoil Hydrating Styling Cream to create the foundation of the style. 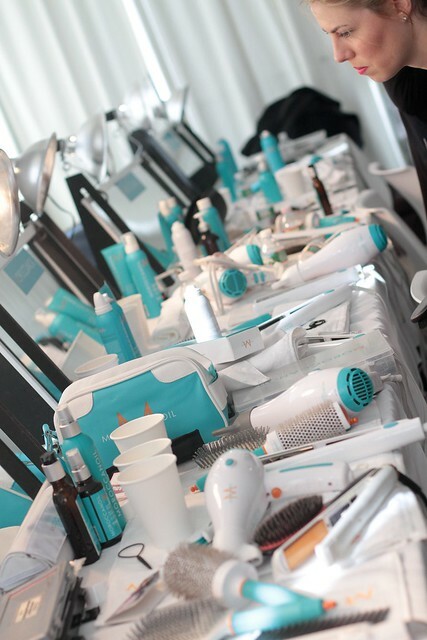 Blow dry sleek and smooth. 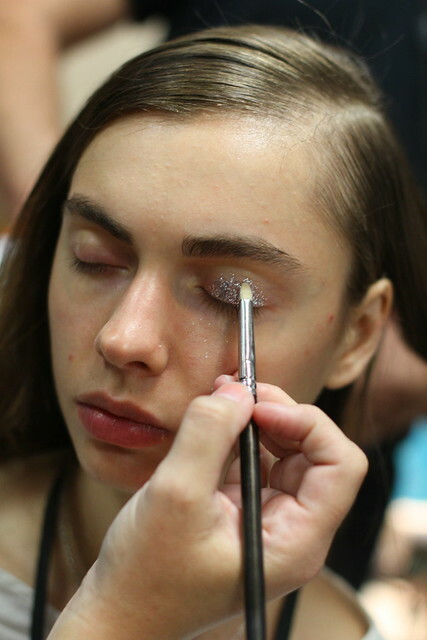 Once thoroughly dry, create a deep left side part. 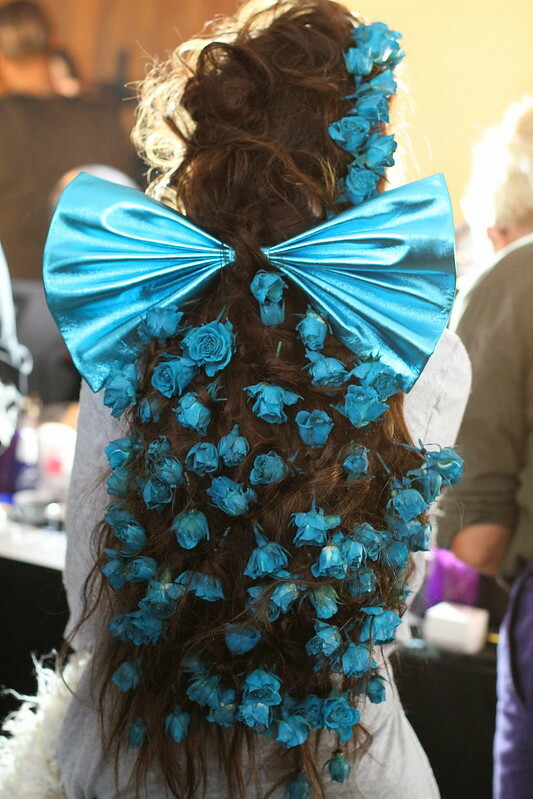 Gather 3″ sections at each side of the part and mist with hairspray. 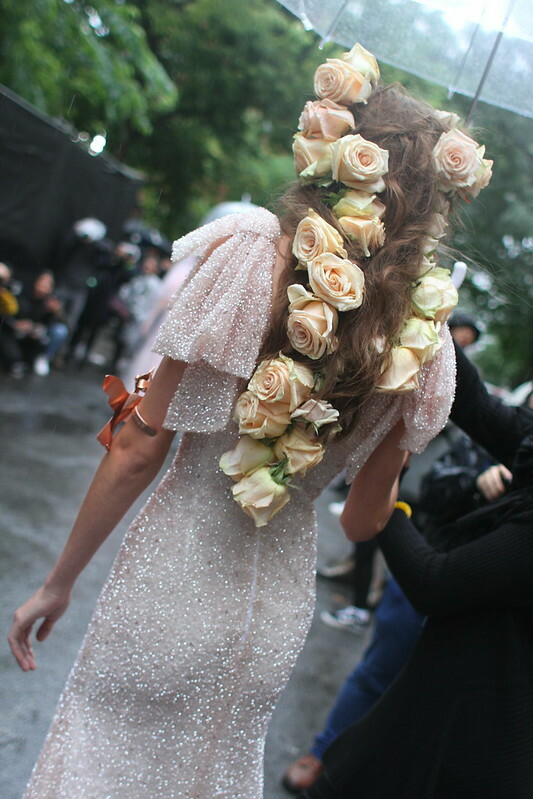 Comb sections back behind the ears and secure underneath the bulk of the hair at the nape of the neck with an elastic. 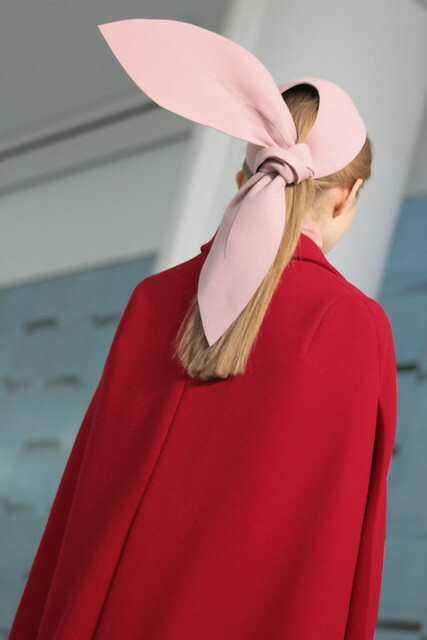 This small ponytail should be hidden. 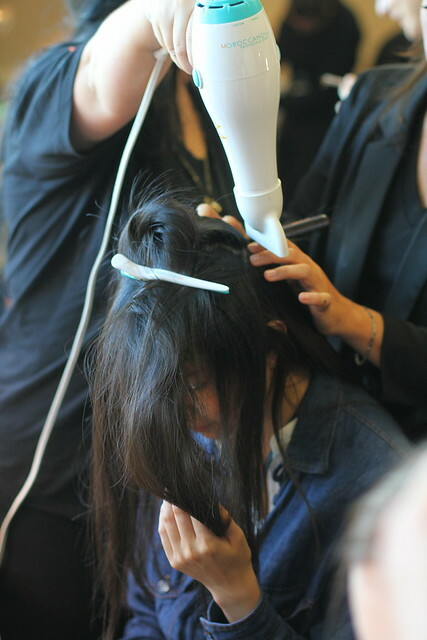 Flat iron all of the loose hair, gently rolling the iron from the mid-shaft to ends to create a natural bend. 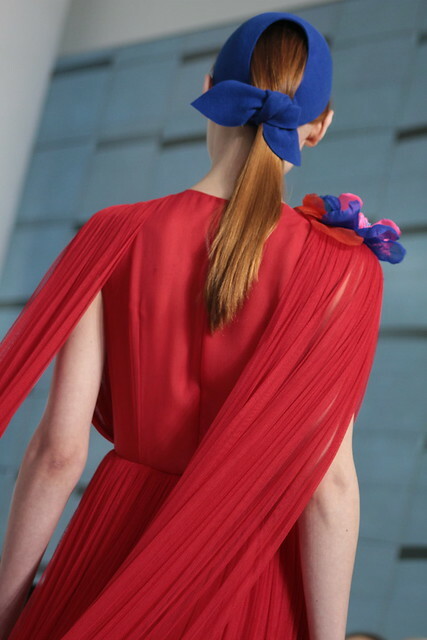 Brush all of the loose hair smooth into a very low and loose ponytail – about mid-back – and secure with an elastic. 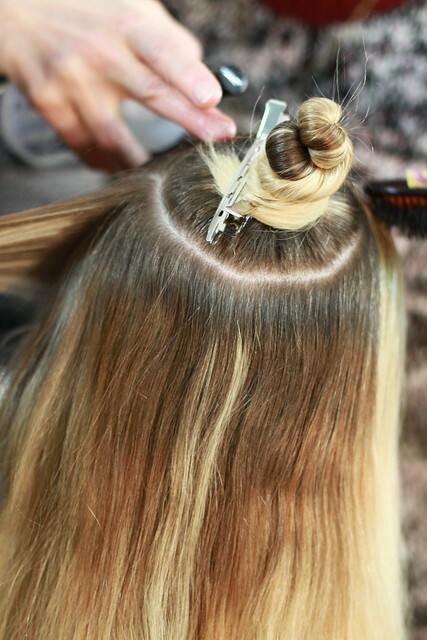 Use your finger to divide the ponytail in half above the elastic (creating a hole). 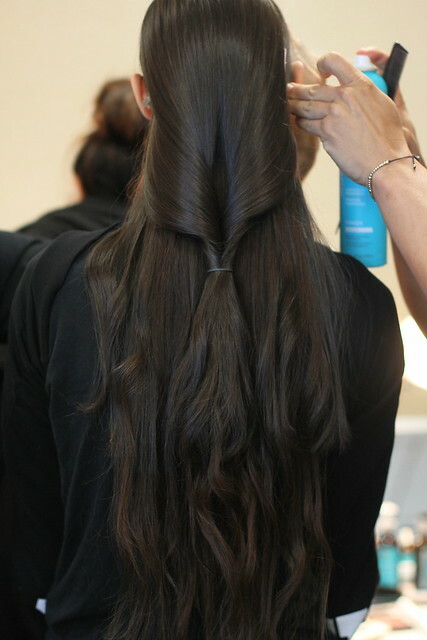 Flip the ponytail up and through the hole to create the twisted style. 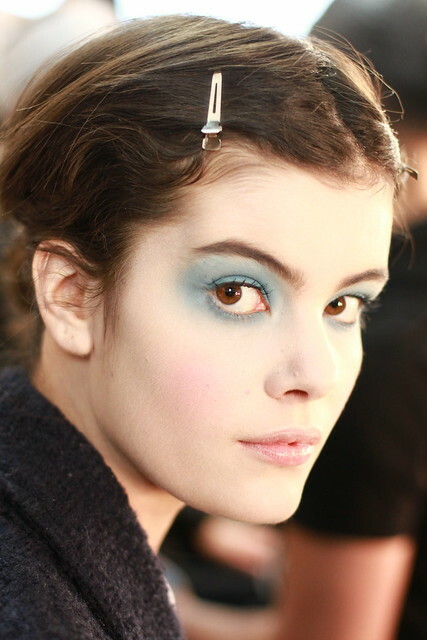 Set the style with a gentle mist of hairspray. 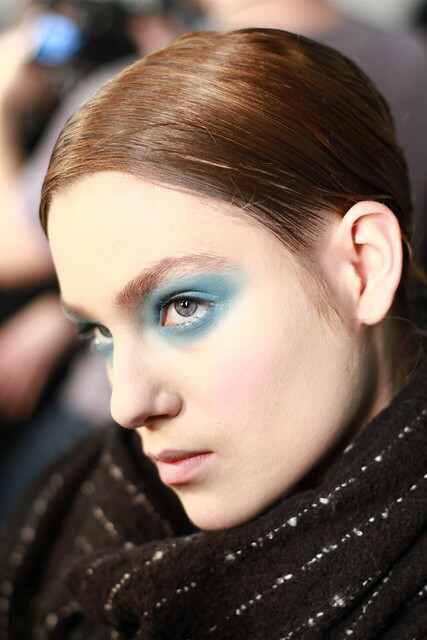 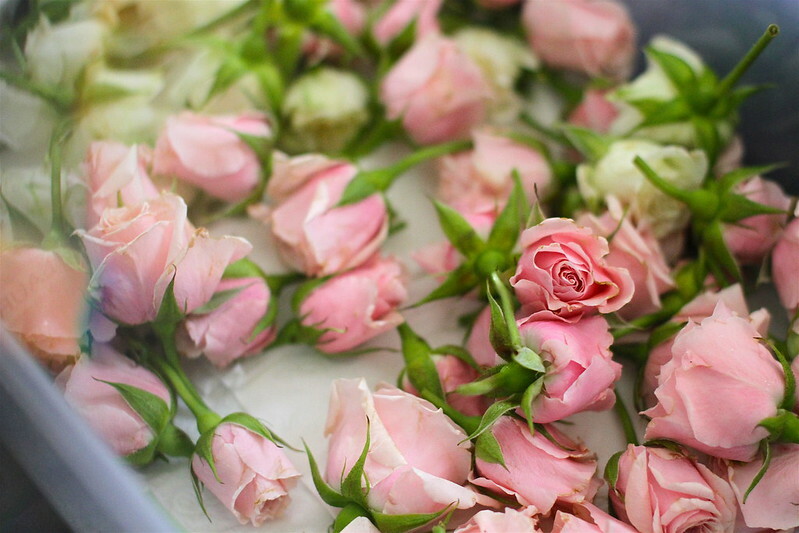 — via Moroccanoil. 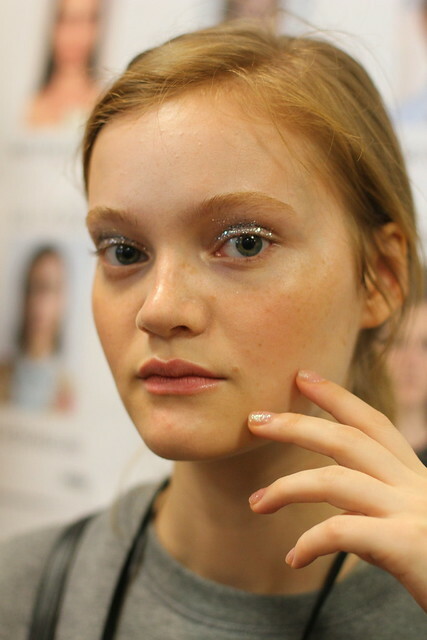 Finally, Julie Kandalec for ESSIE created an adorable, subtle glitter nail that perfectly complimented the eye makeup, using Sparkle On Top. 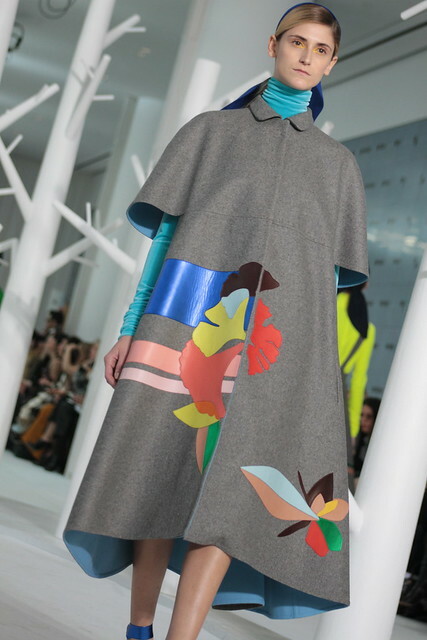 Two things I love the most about Delpozo collections: they always use interesting fabrics and materials, and play with volume. 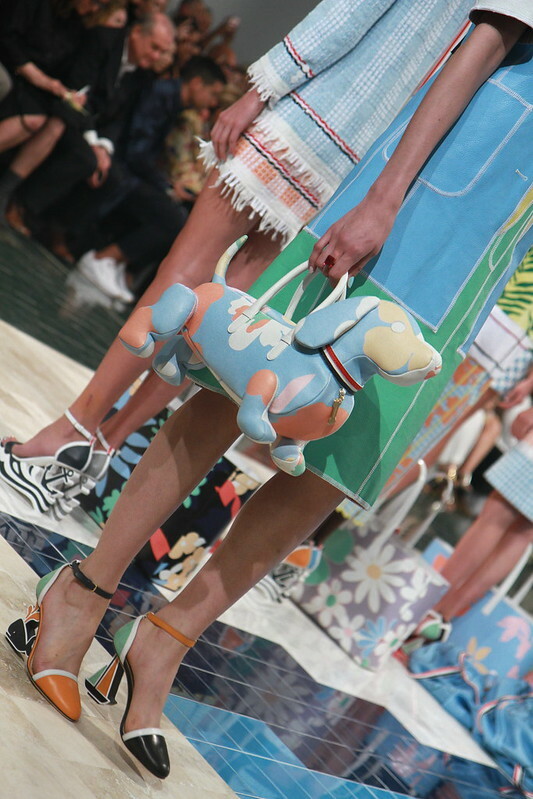 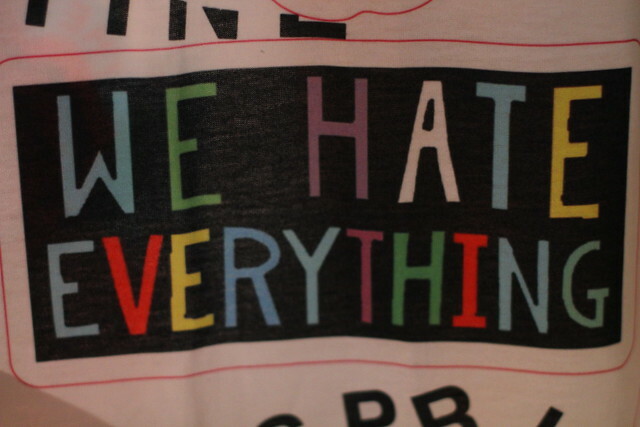 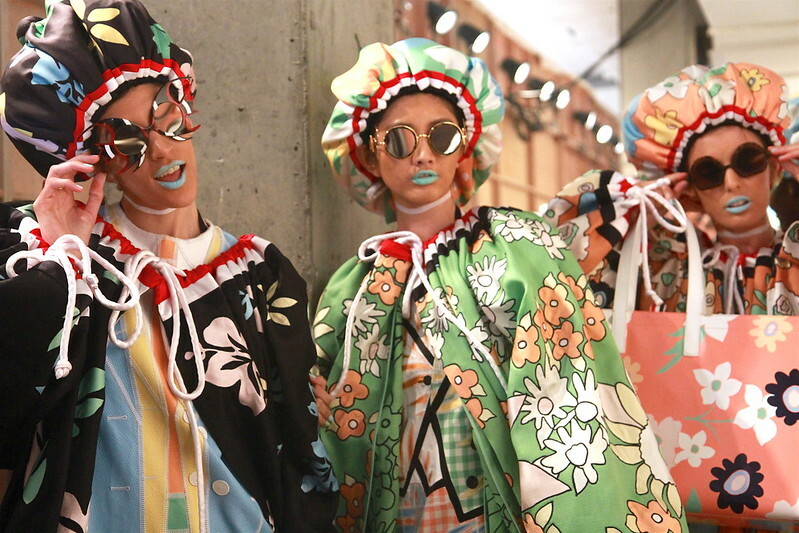 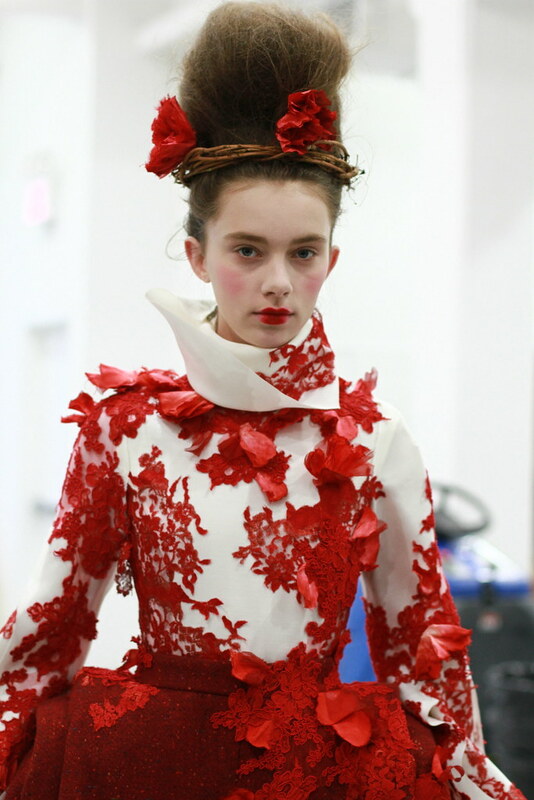 I can’t think of many other modern designers who have so much fun creating unique shapes and garments out of fabric. 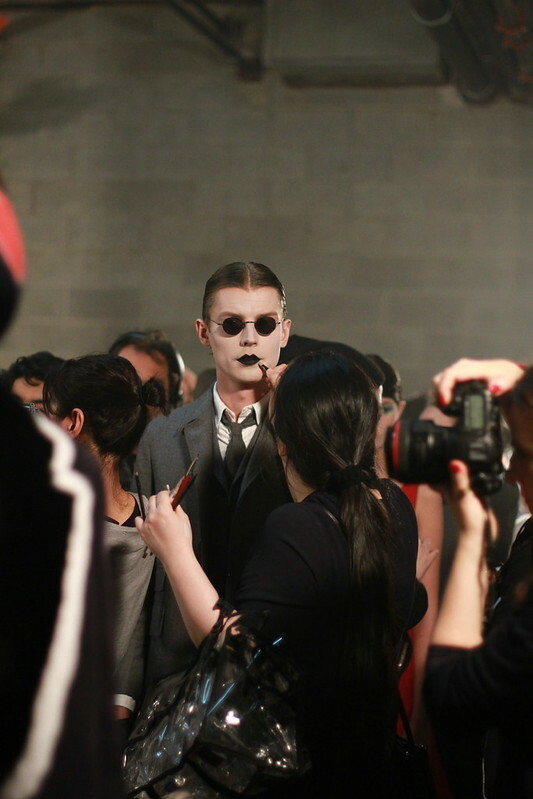 All Photos and Content ®2015-2016 Rachel Scroggins/The Greyest Ghost. 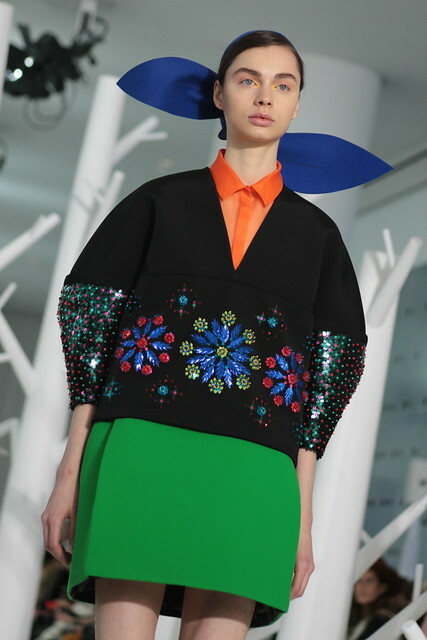 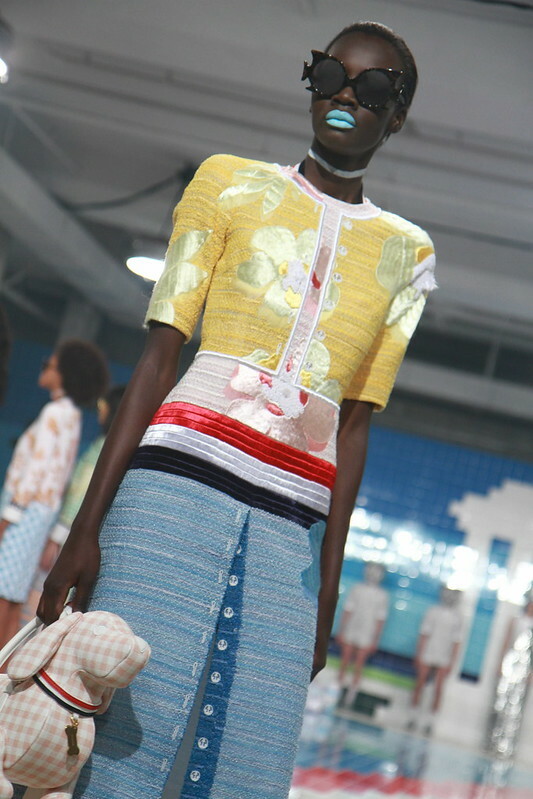 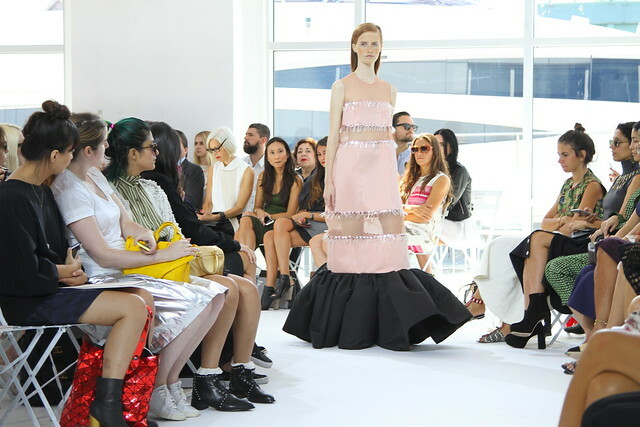 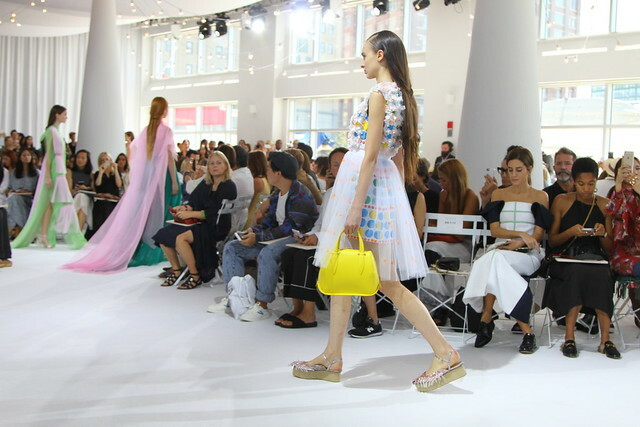 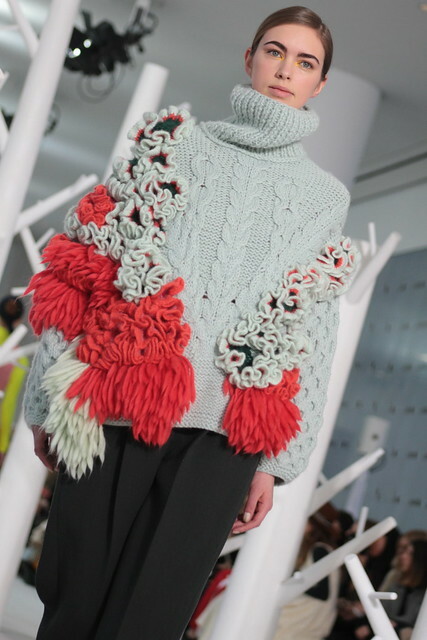 Delpozo is unlike any other brand currently showing at New York Fashion Week. 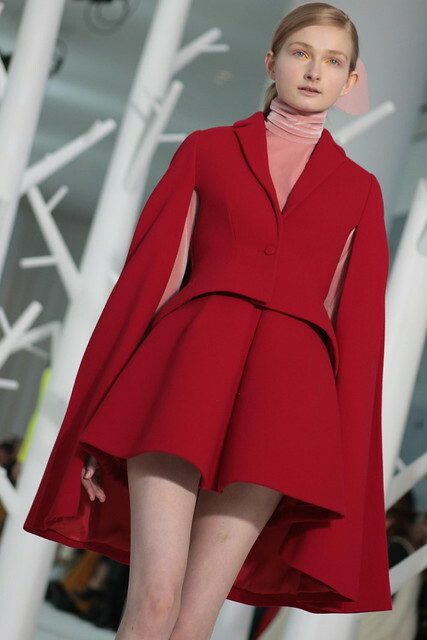 Elegant, impeccably tailored clothes, with gorgeous handmade embellishments that out-do much of what is shown on modern runways. 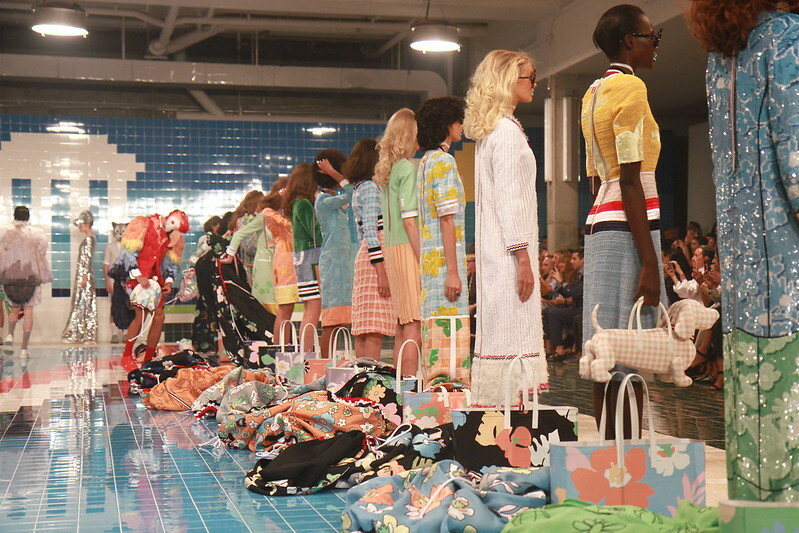 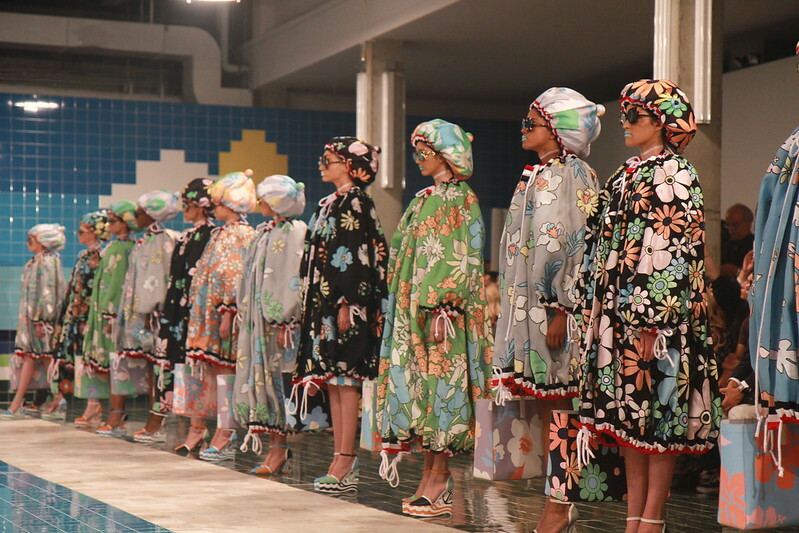 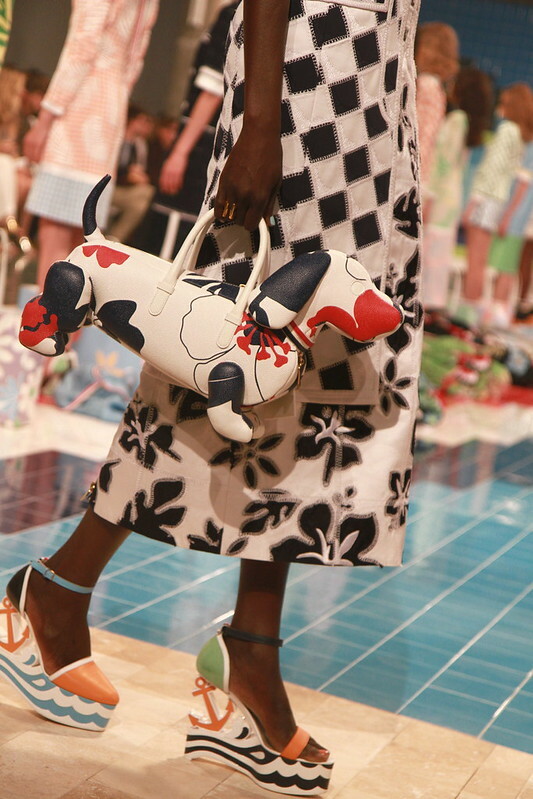 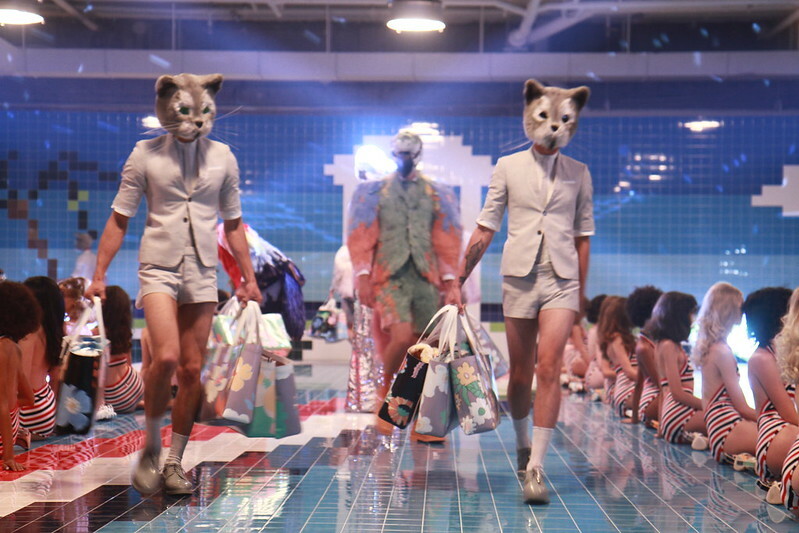 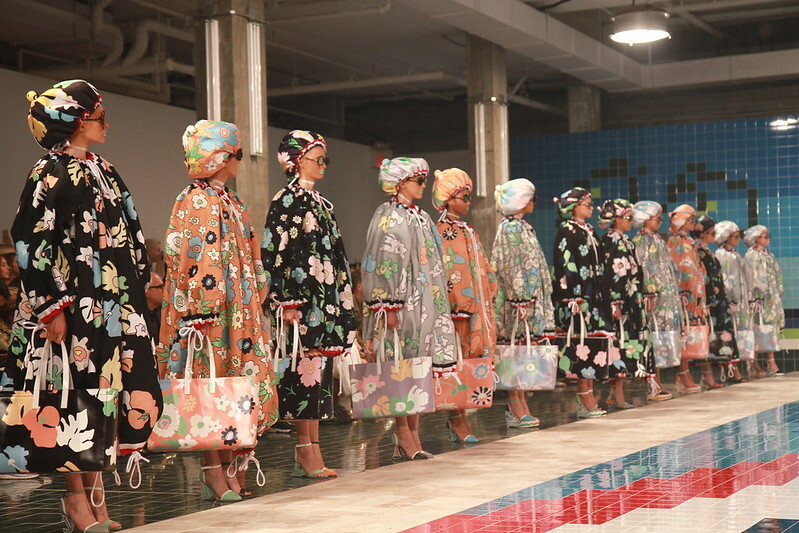 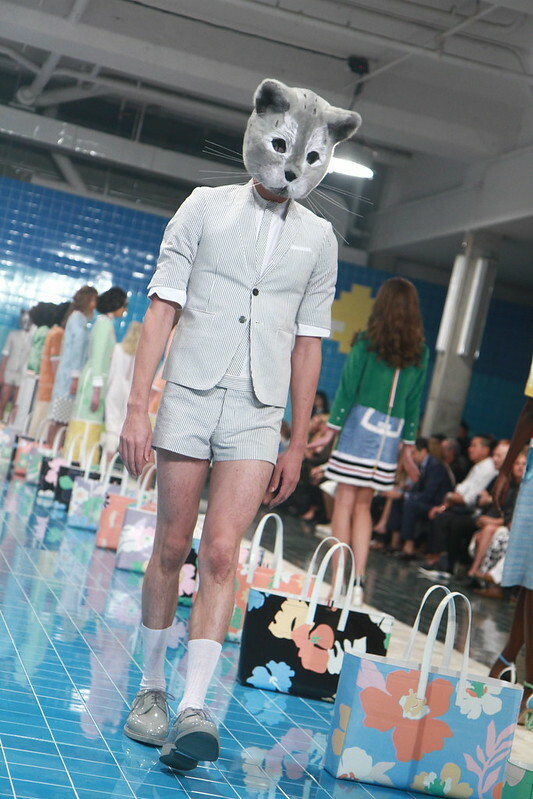 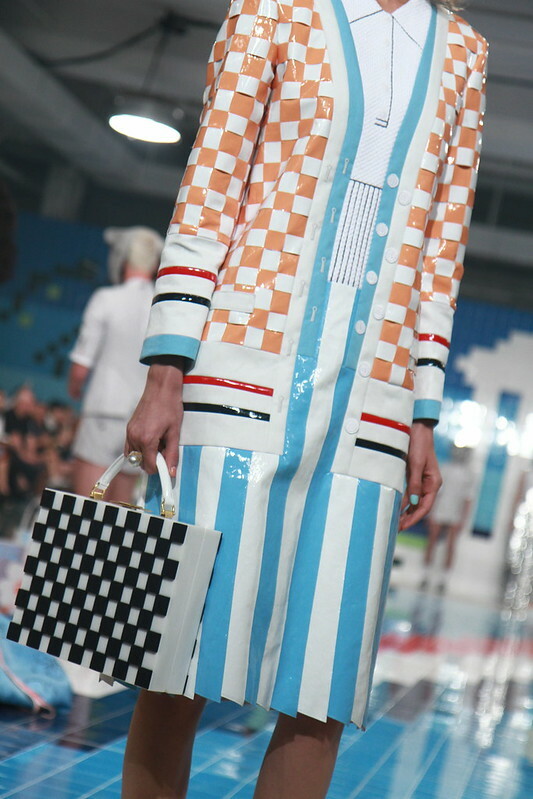 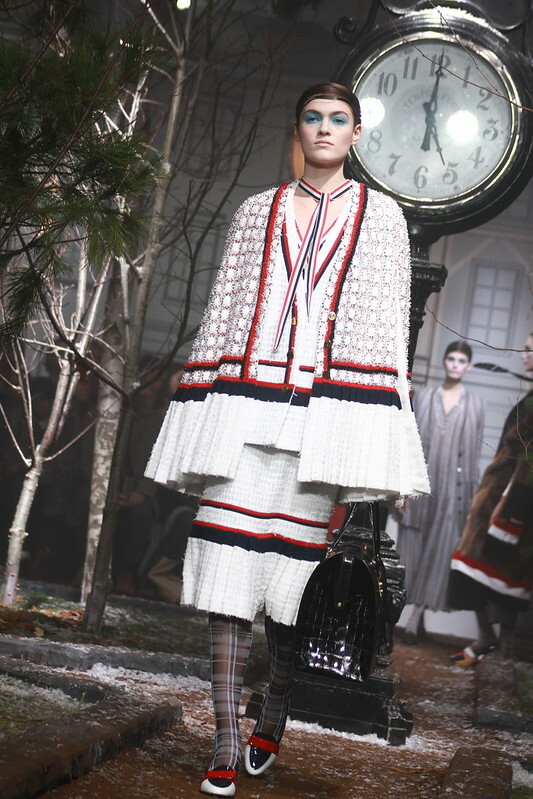 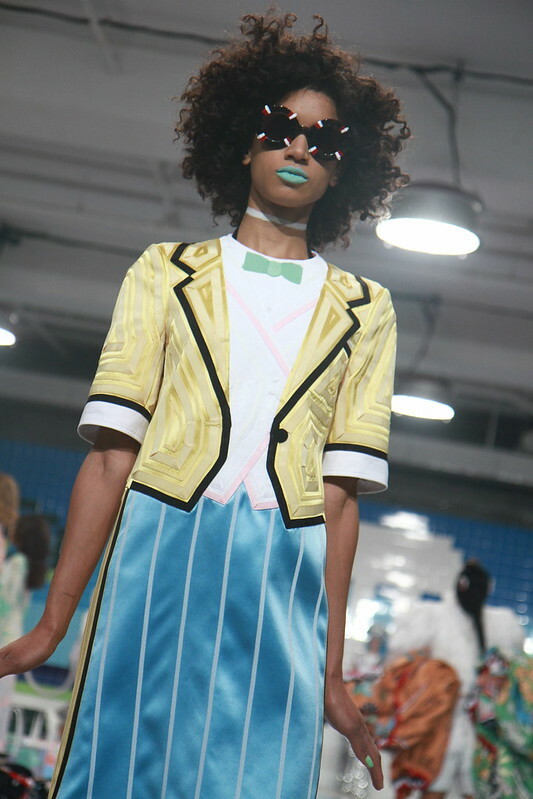 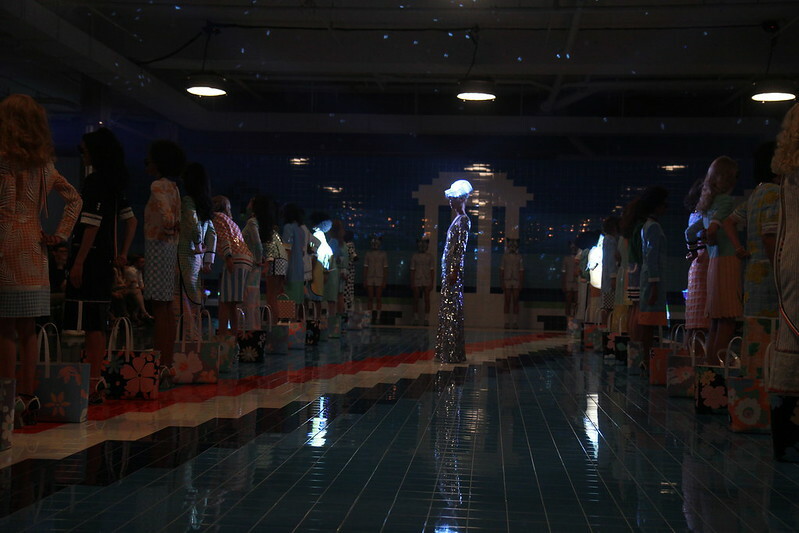 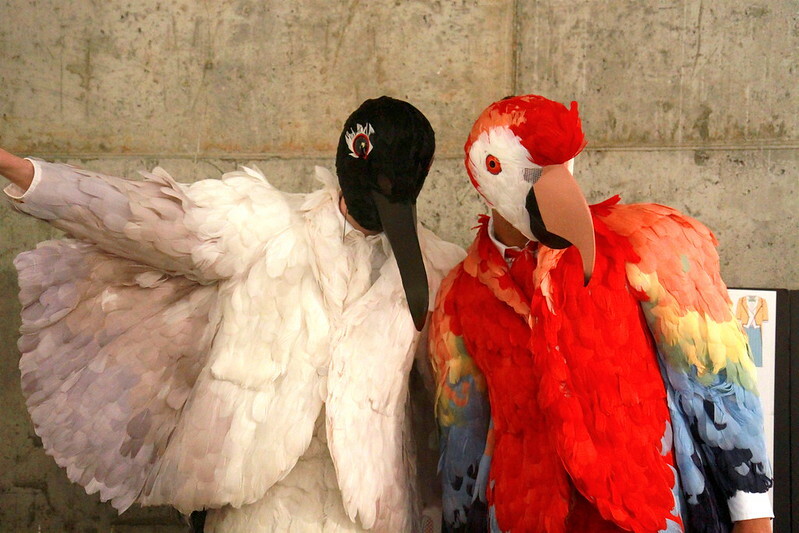 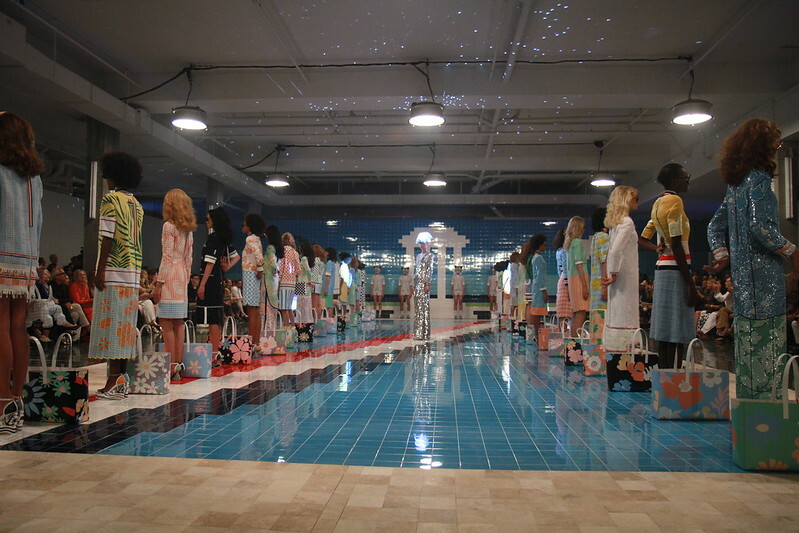 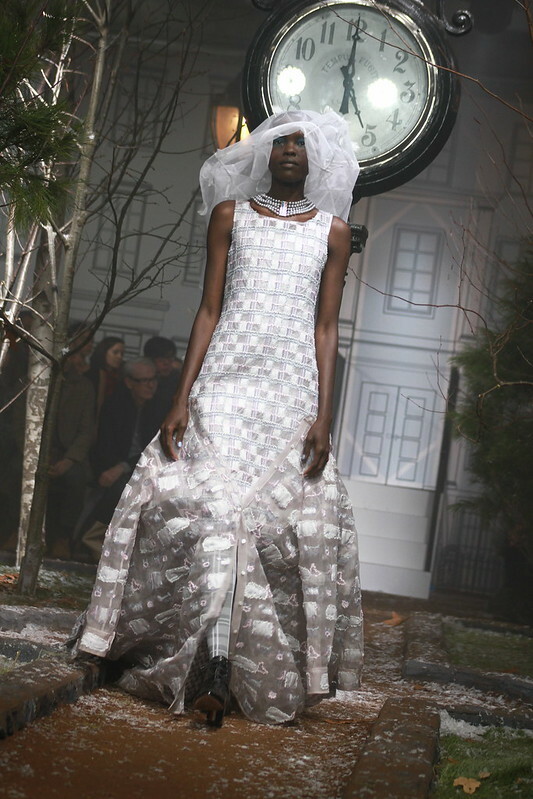 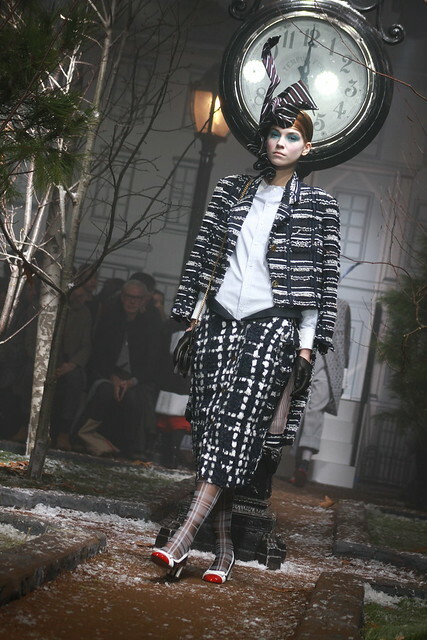 The closest I can liken the experience to, is a less theatrical version of attending a Thom Browne show. 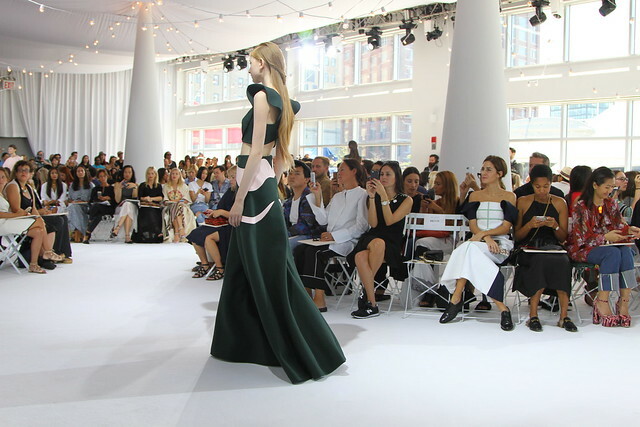 And while both would seem more at home somewhere amongst the Paris couture shows, they stand out in a sea of “average”, and are the highlights of my NYFW show list. 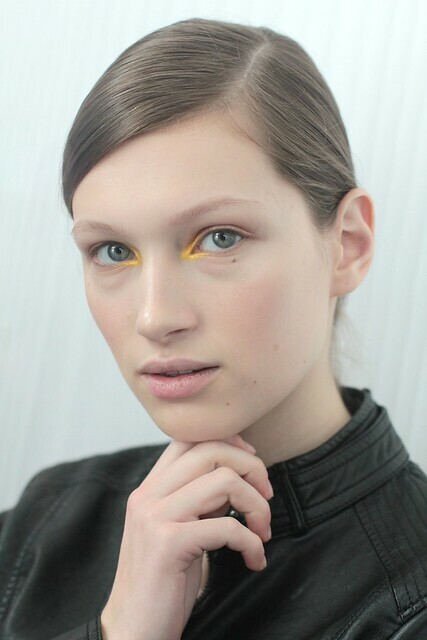 Backstage, the works of painter Andrey Remnev served as inspiration for the collection, and the beauty, which translated into a look meant to mimic by “solid gold”. 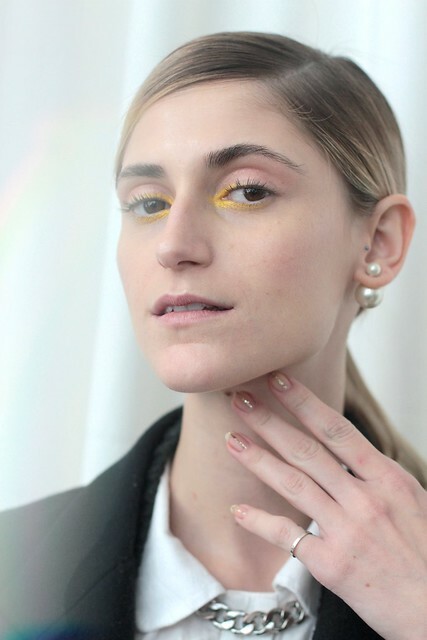 ESSIE lead manicurist Julie Kandalec created a look featuring a small, but flashy stripe of gold glitter, meant to look as if models had “just pulled their hands out of gold”. 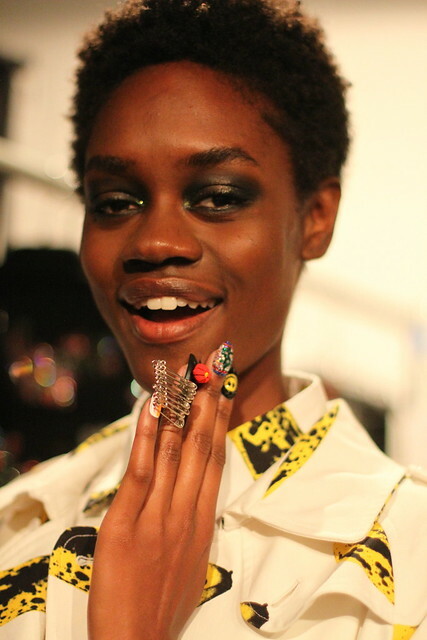 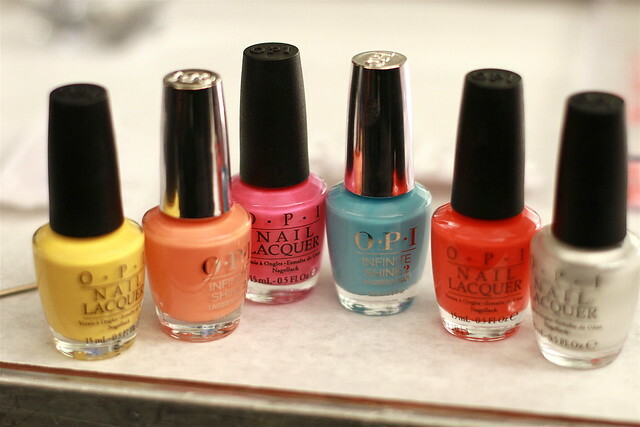 To get the look: Nails were prepped with one coat of Matte About You. 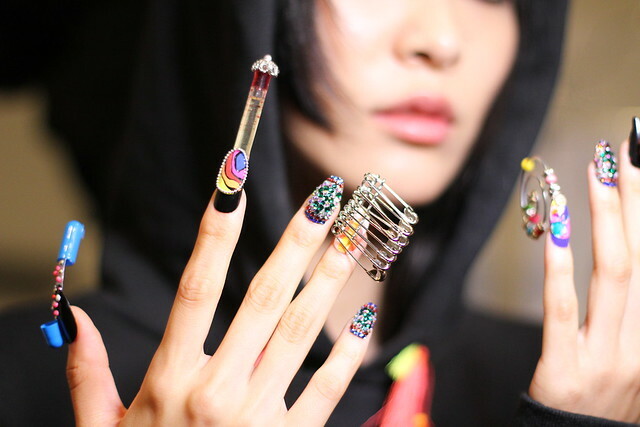 Next, using a striping brush, Good As Gold was applied in a fine strip down the center of the nail. 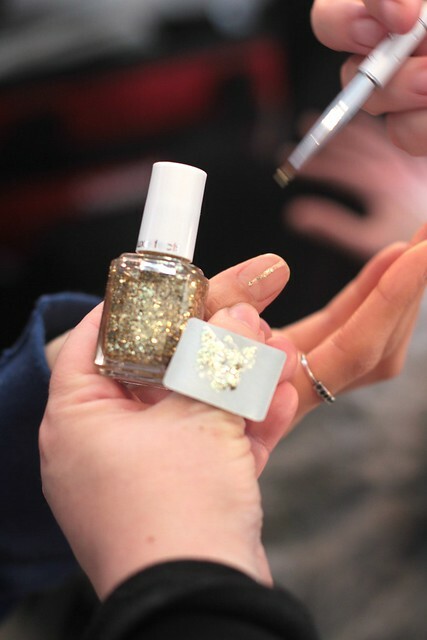 Gold glitter polish Rock at the Top was applied over the stripe, and the look was completed with a coat of Second Shine Around (only on the stripe). 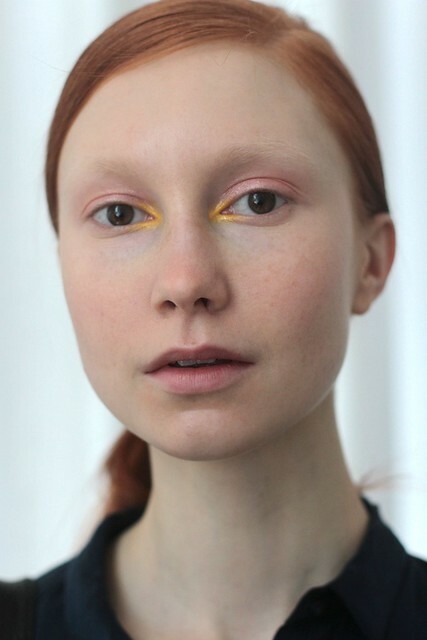 MAC senior artist Victor Cembellin created a “washed out” painterly makeup look, leaving skin and lips more natural, and focusing on the eyes. 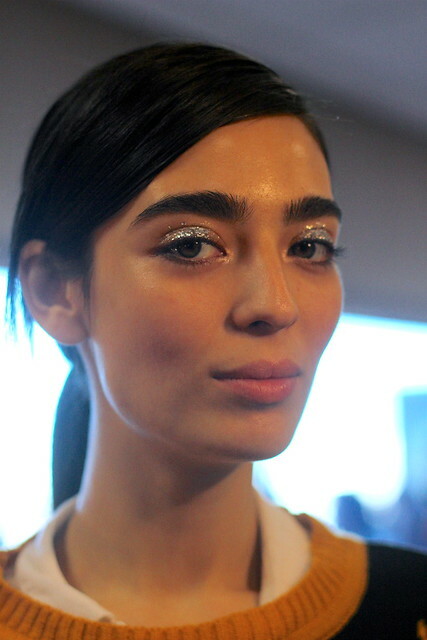 To get the look: A blend of Motif Eye Shadow, Pervette Lipstick, and Reflects Gold Pro Glitter were applied to the corners of the eye. 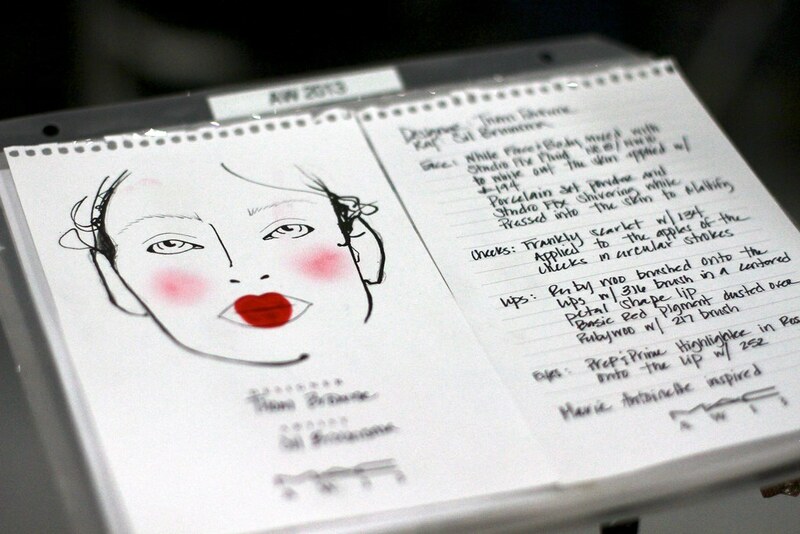 To complete the process, Studio Waterweight Foundation was applied to model’s lips to tone down natural lip color while MAC’s Dare you lipstick was applied to cheeks to create a rosy accent. 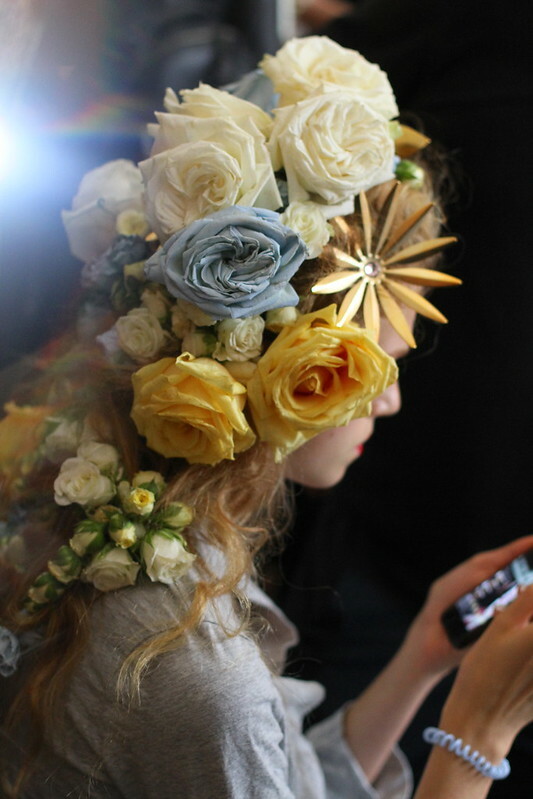 Hair focused on simplicity, with the focus this season being on the headpieces added just before the models walked the runway. 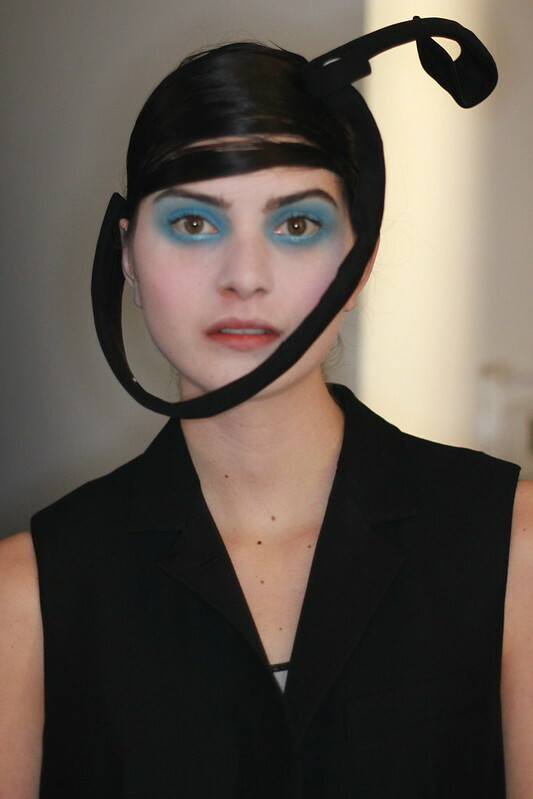 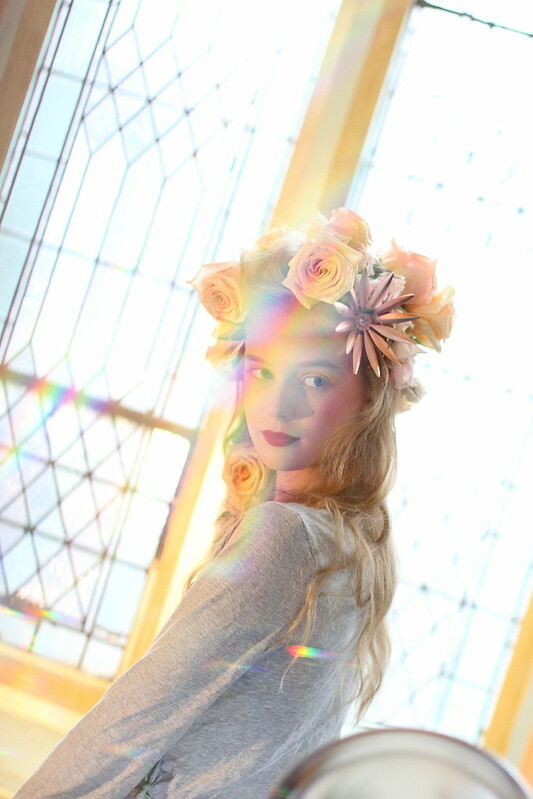 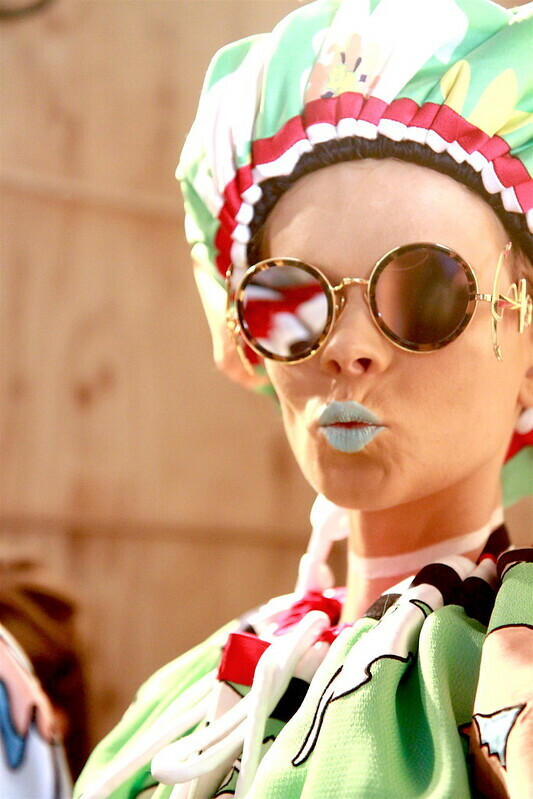 The gorgeous, twisted fabric headpieces. 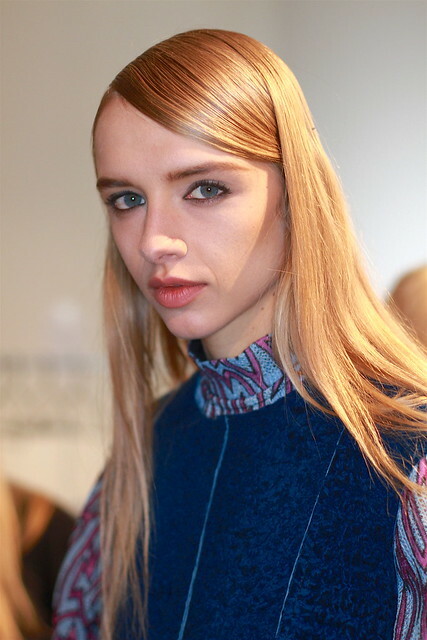 To get the look: Moroccanoil Global Creative Director Antonio Corral Calero applied Moroccanoil Treatment, and flat ironed hair straight. 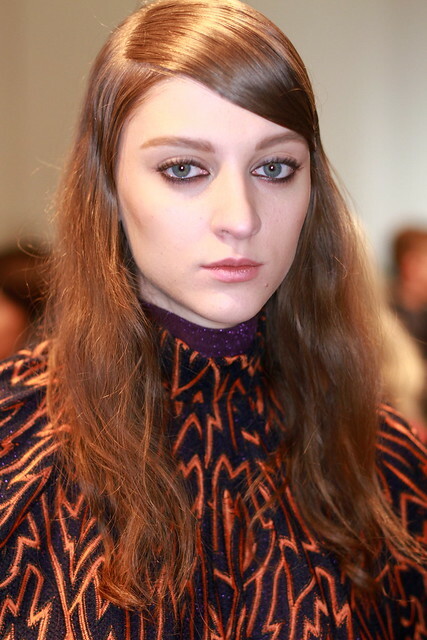 Next, hair was pulled into a sleek, side-parted ponytail. 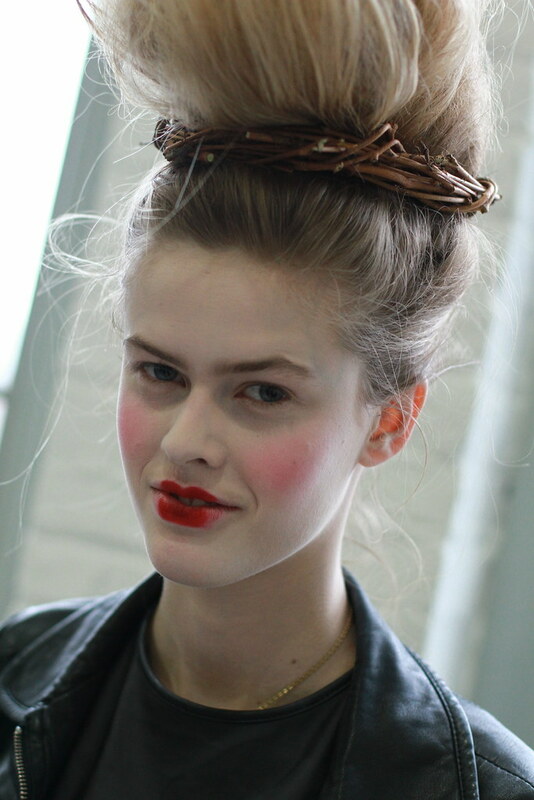 The look was finished by using Moroccanoil Luminous Hairspray to secure the look, and delicately pulling the pony tails through the headpieces. 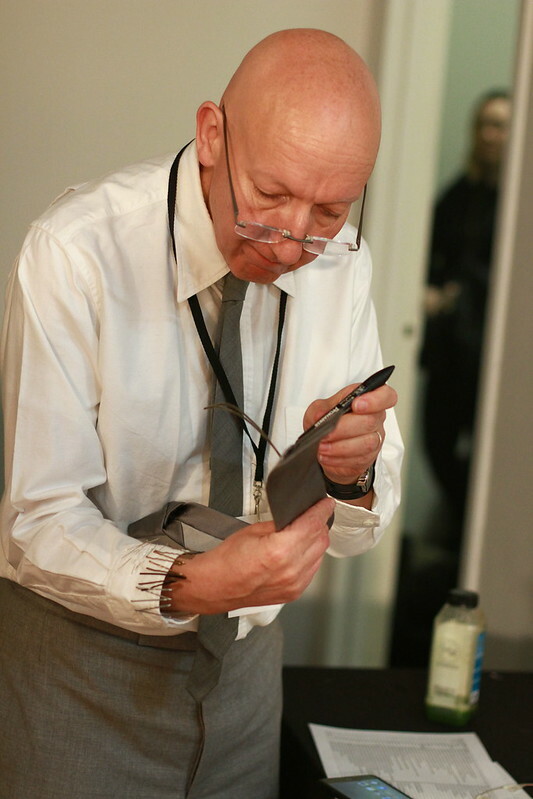 Designer Josep Font, taking a bow. 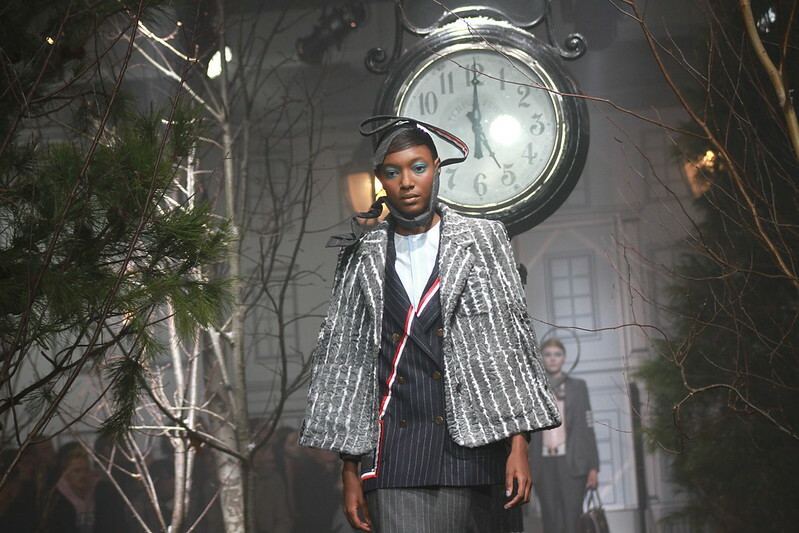 Over the past eight seasons, I’ve photographed many exciting, beautiful, and inspiring fashion shows– over 200 of them. 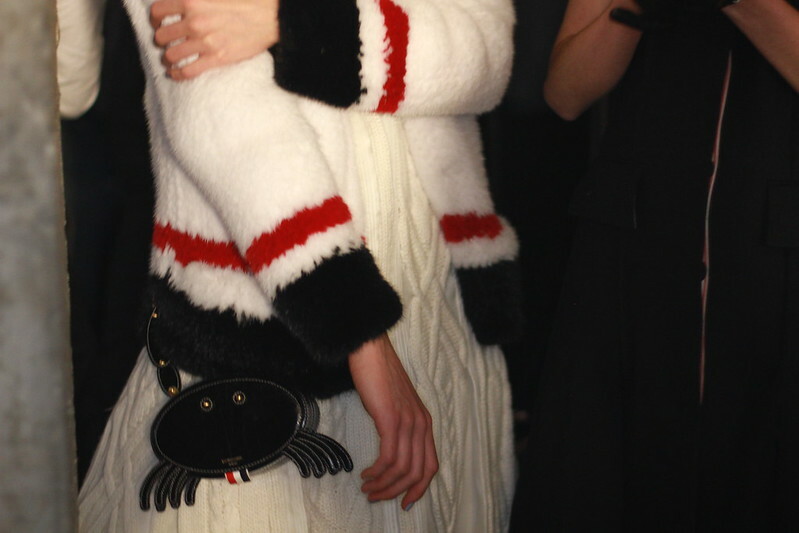 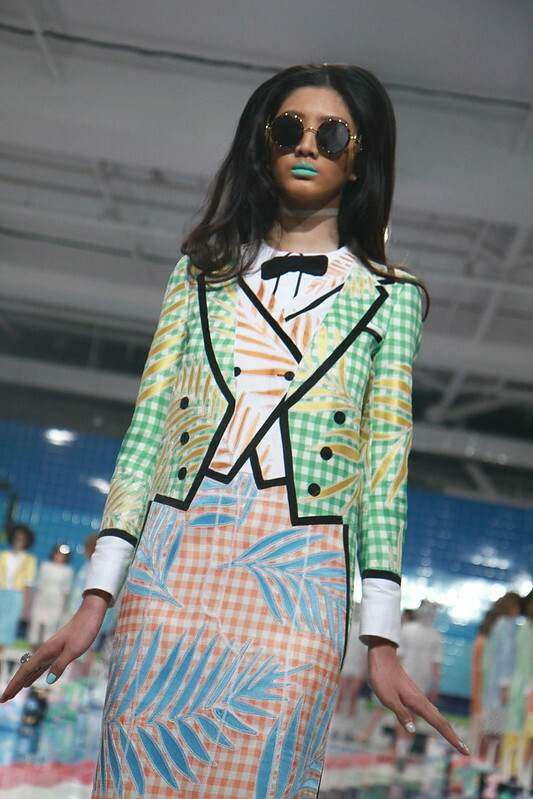 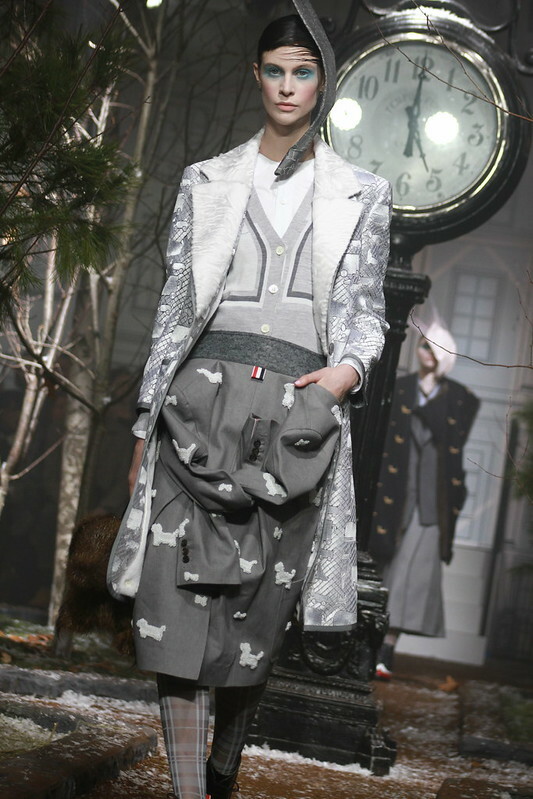 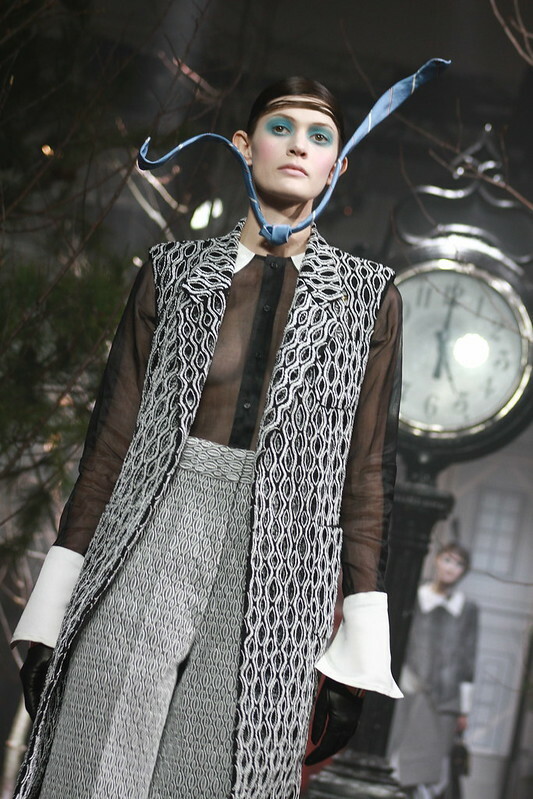 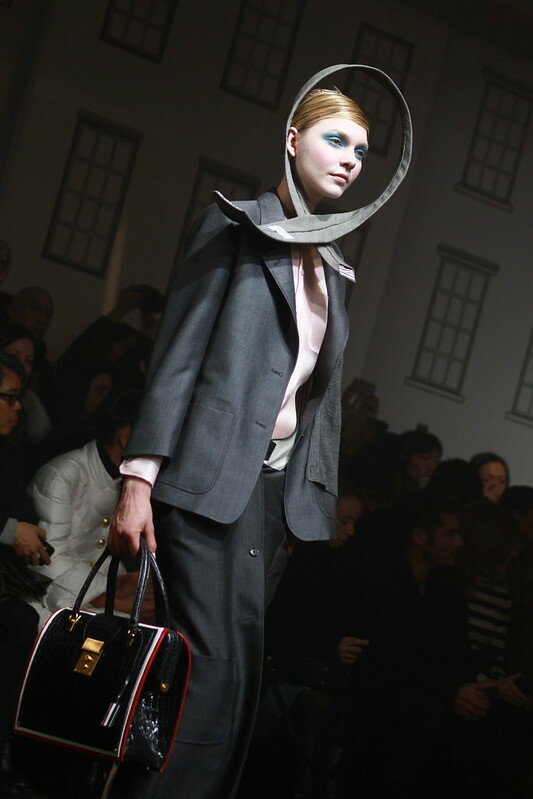 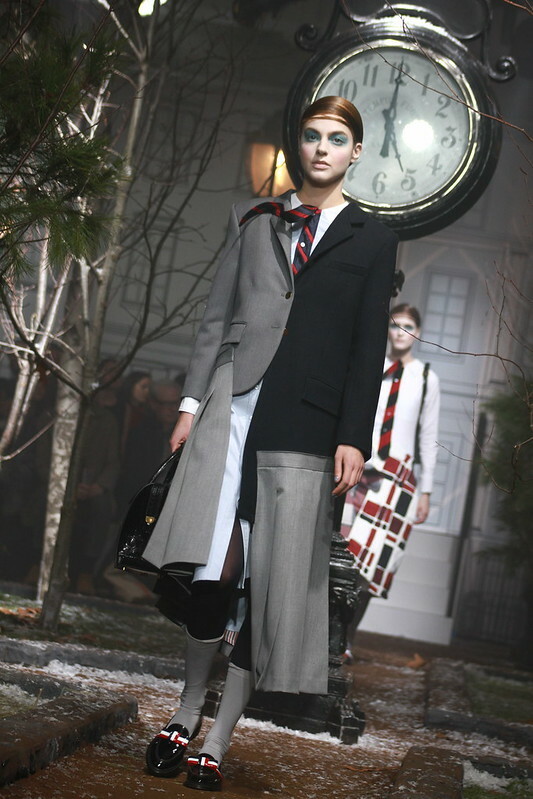 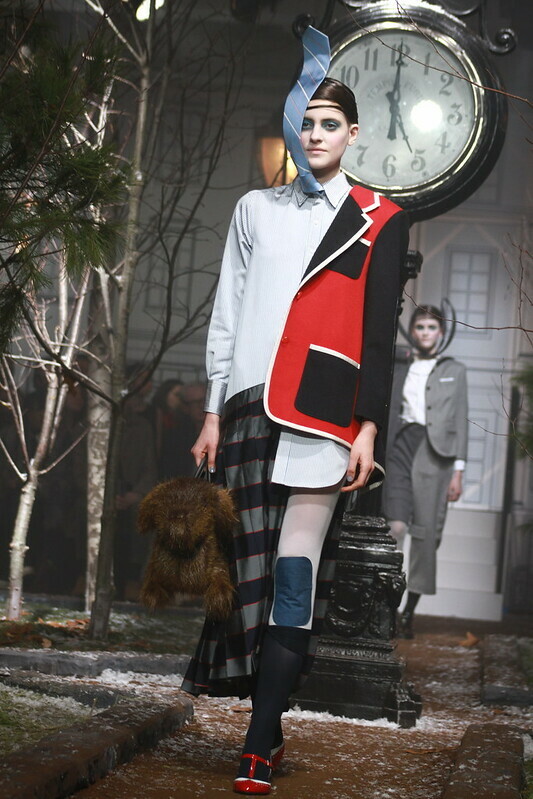 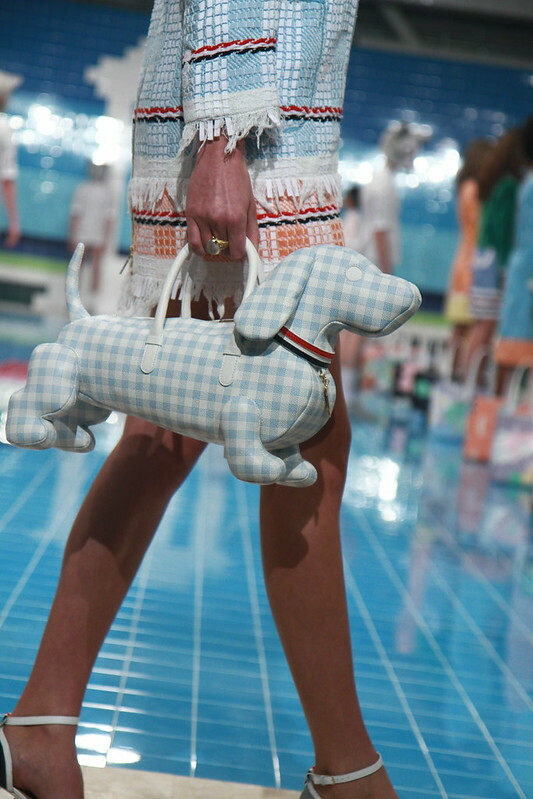 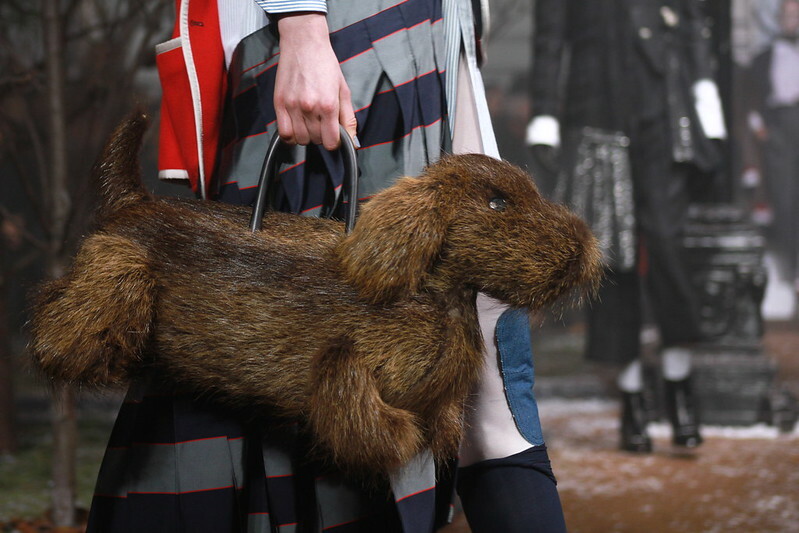 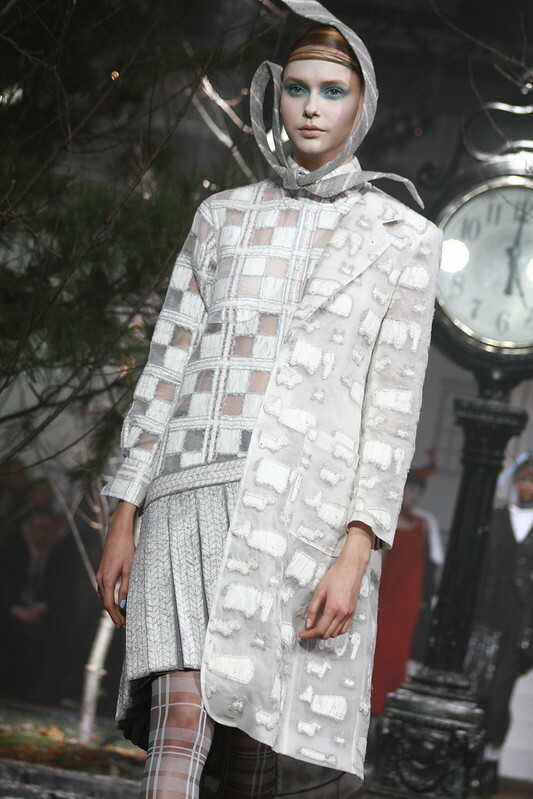 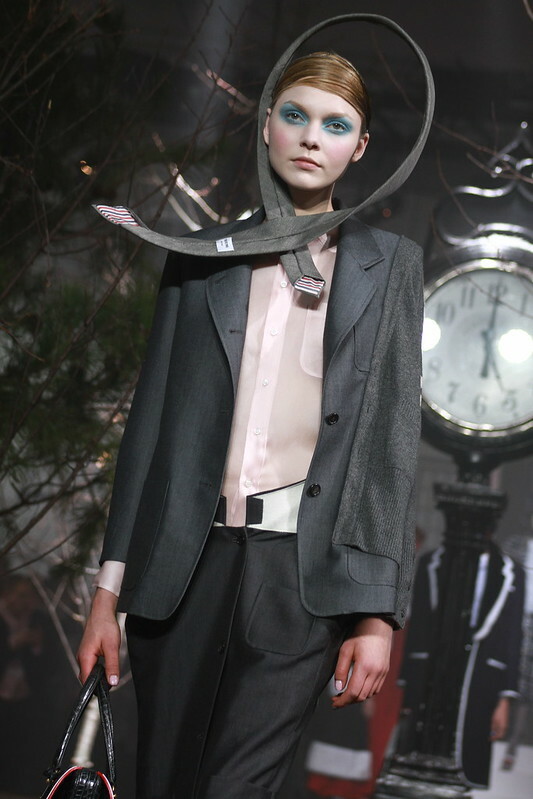 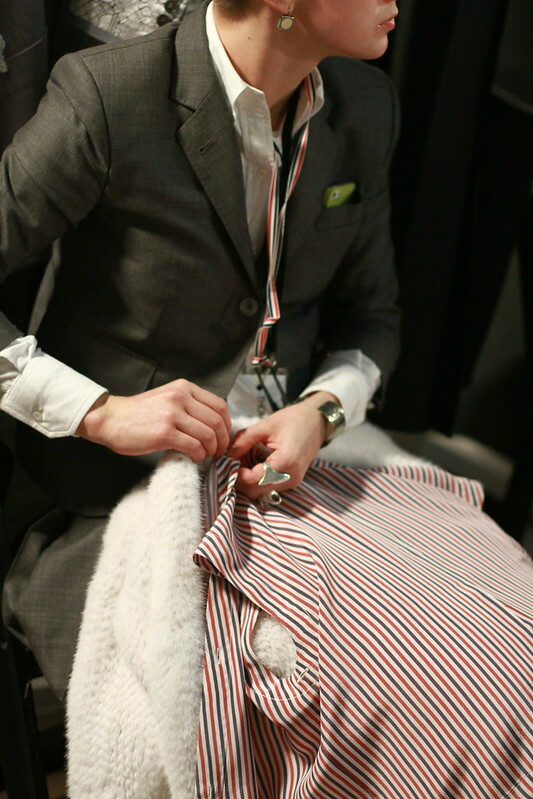 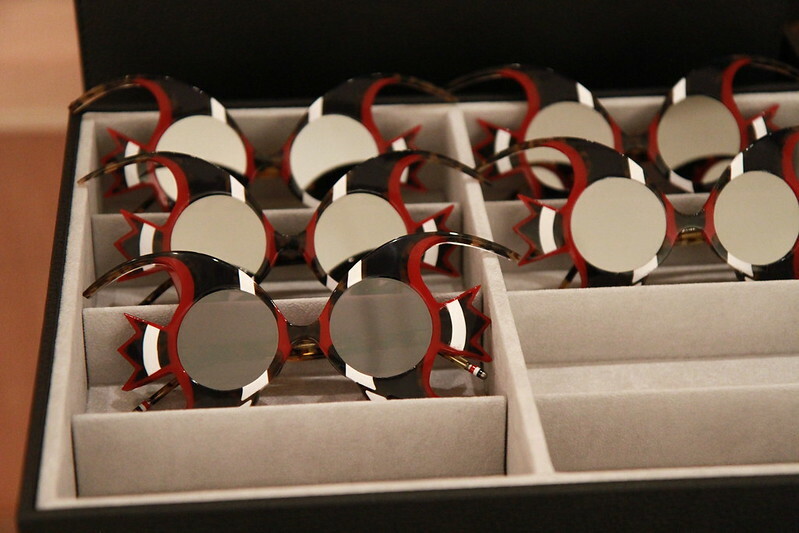 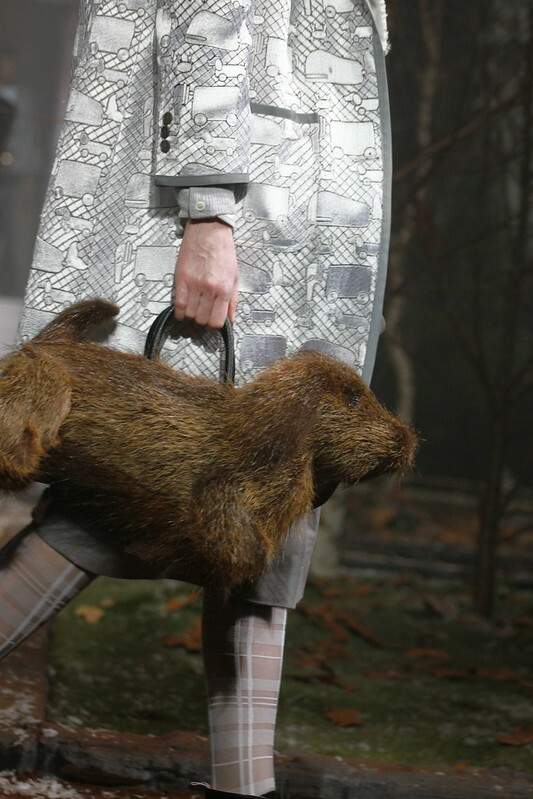 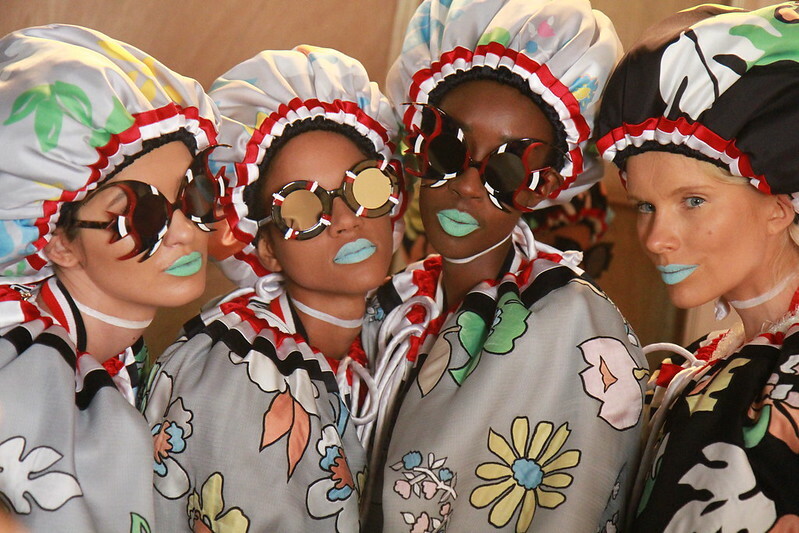 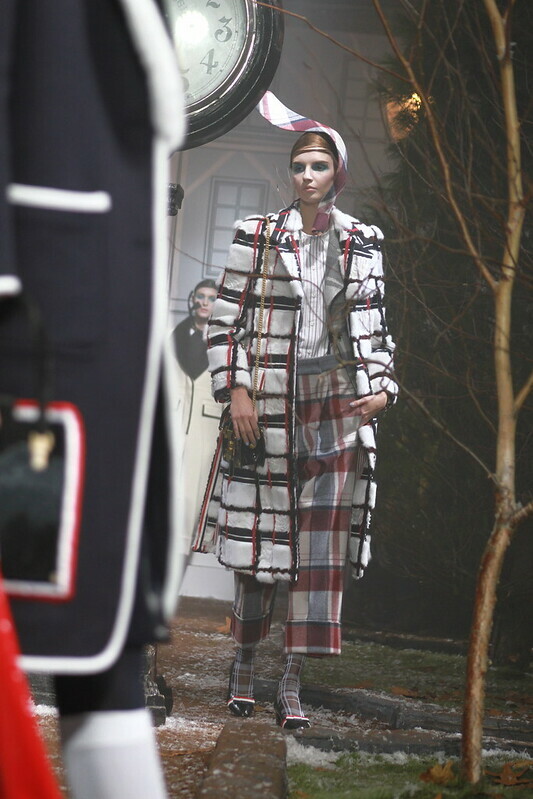 Thom Browne’s Fall 2013 show is my favorite of them all. 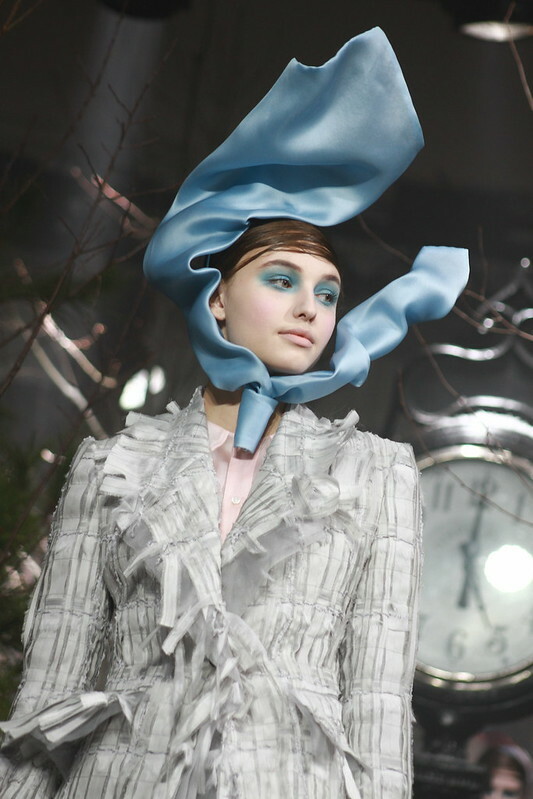 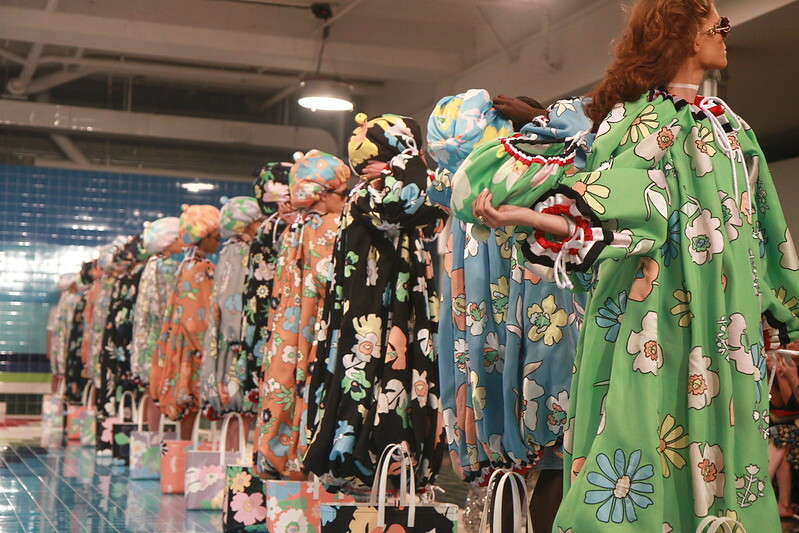 Every detail, from the backstage beauty to spooky, wintery runway show was perfect, making the viewer feel as if they were transported to a couture show in Paris, rather than a loft space in New York’s Chelsea. 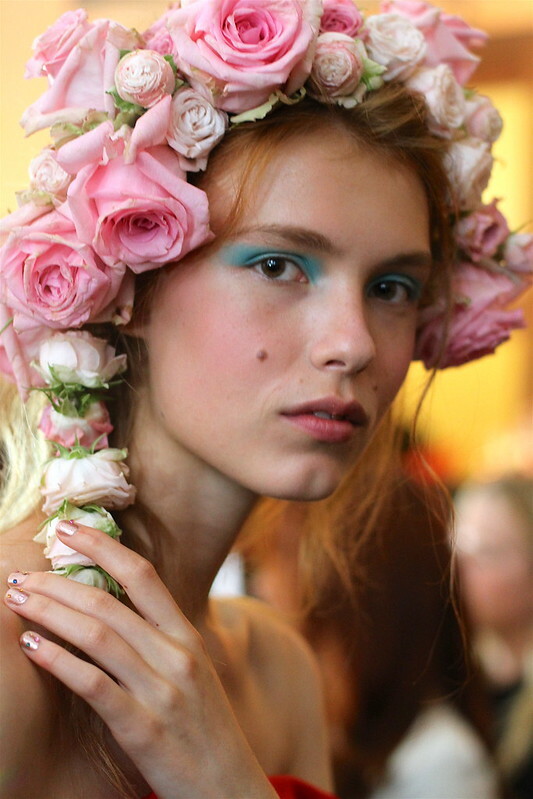 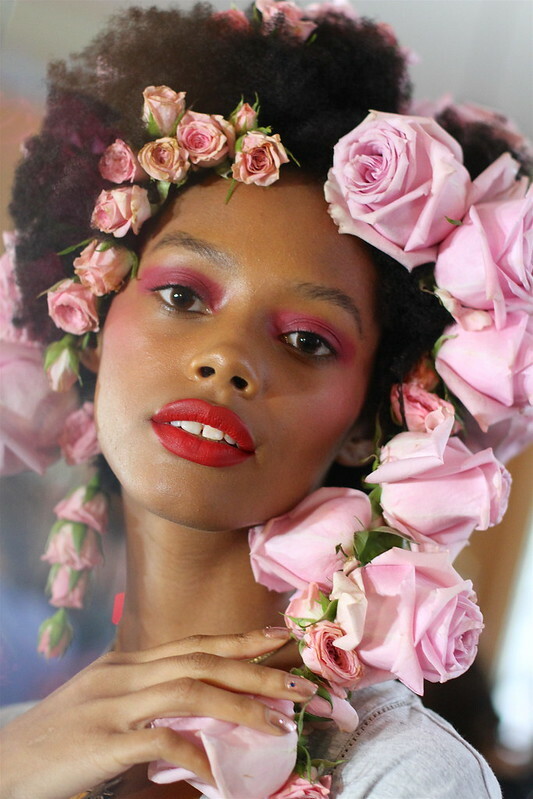 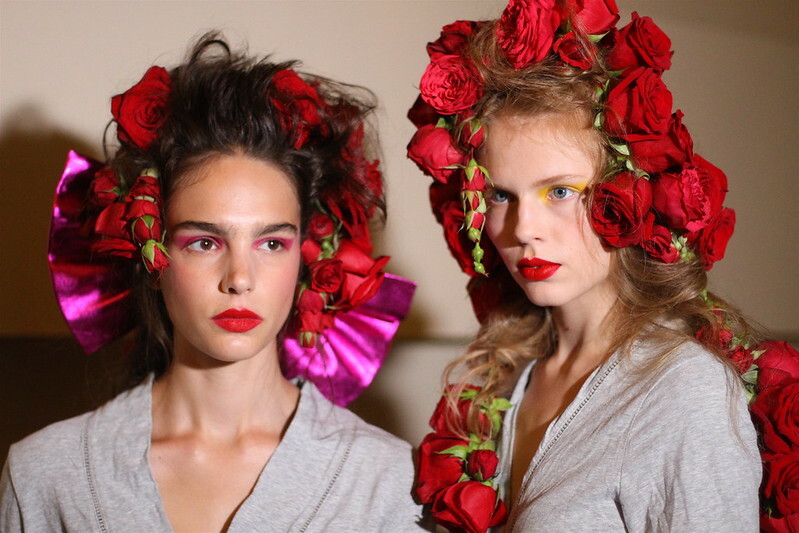 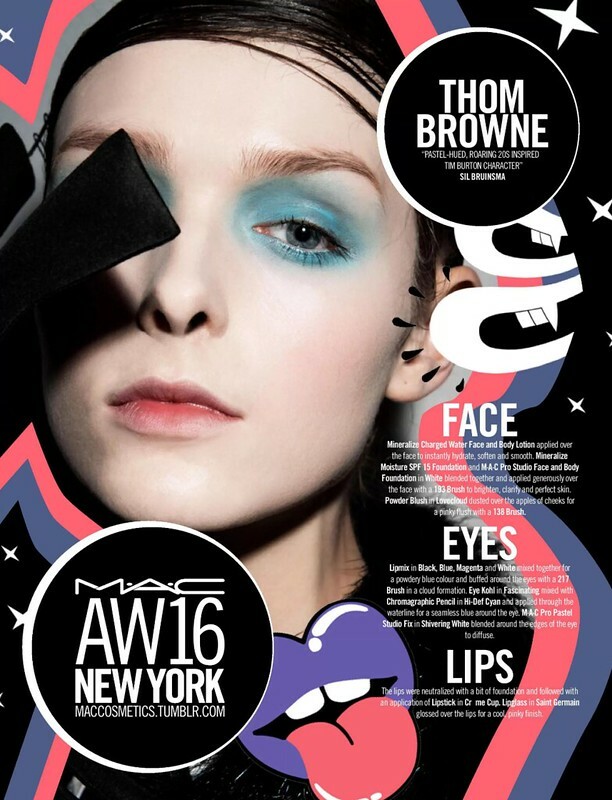 Mac Cosmetics’ Sil Bruinsma created a dazzling look inspired by Marie Antoinette, and The Queen of Hearts, focusing on whited out faces and bright red cheeks and lips. 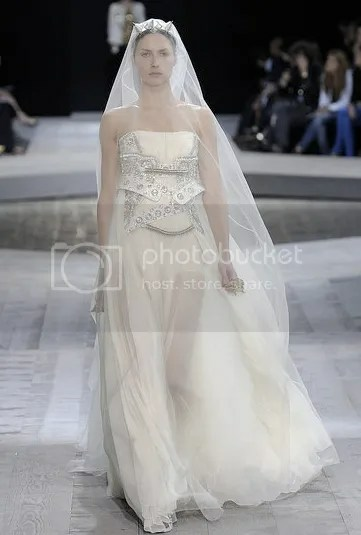 I am in love with Givenchy’s Fall ’09 Couture collection. 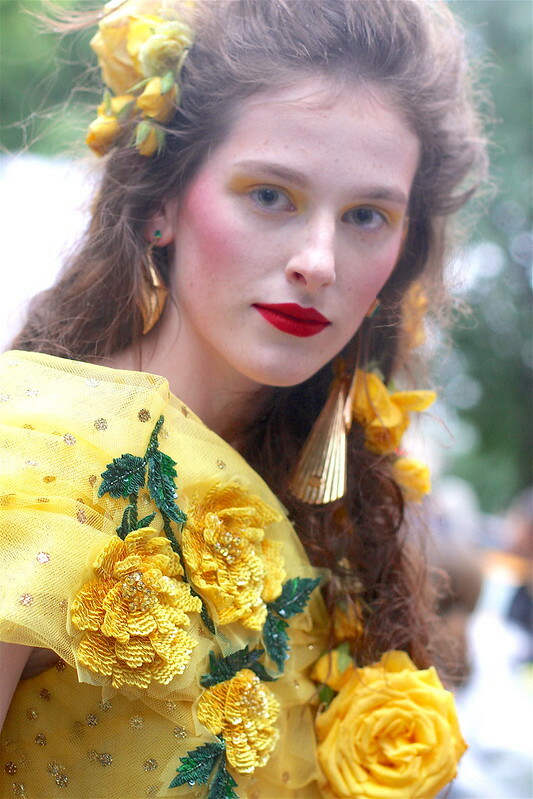 I’ve always admired middle eastern and Persian traditional fashion–the jewelry, the beading, the gold. 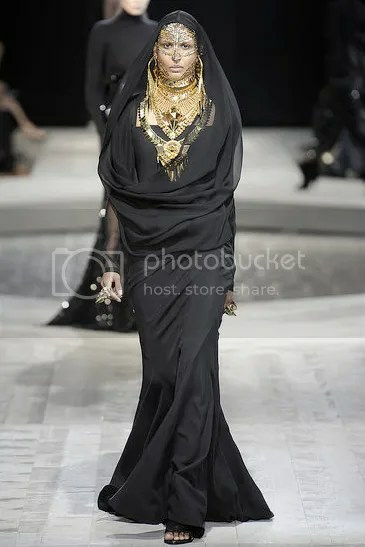 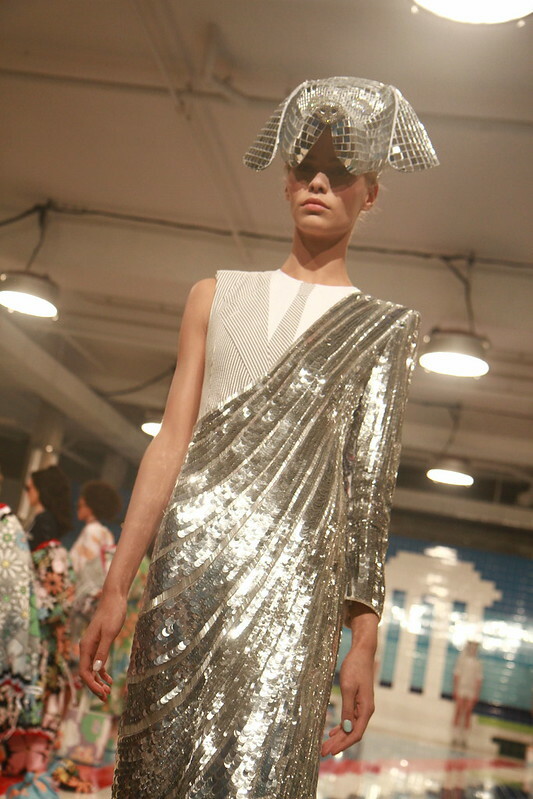 This season Riccardo Tisci showed more of his usual awe inspiring gowns, with an added focus on accessories such as saris, veils, chain maile, head pieces, and full arms of bangle bracelets. 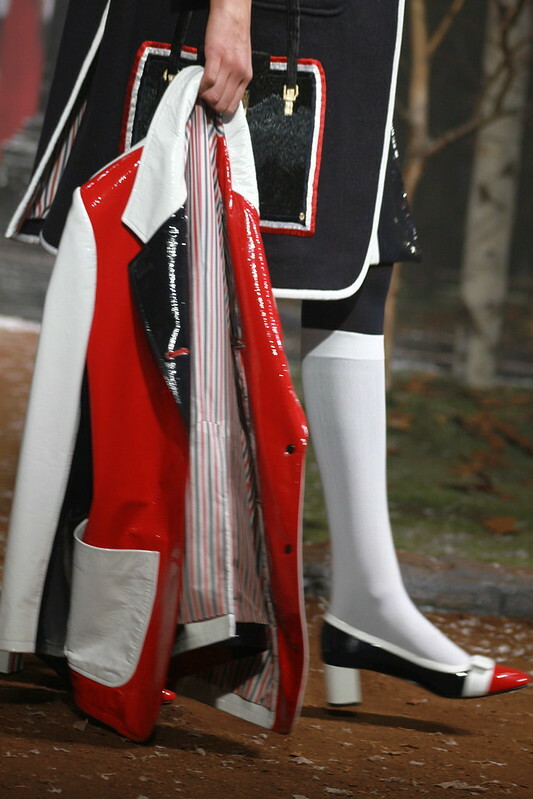 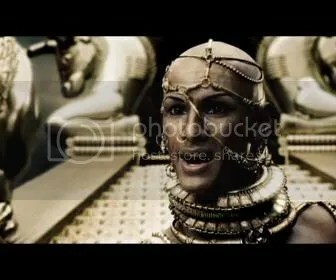 I can’t find any close up shots floating around the internet. 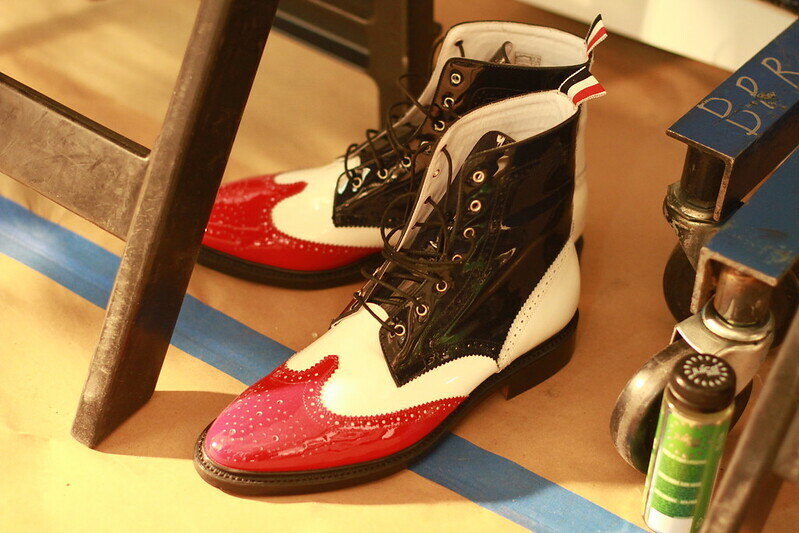 But if you have a chance, check out the lace up heels and open toed boots. 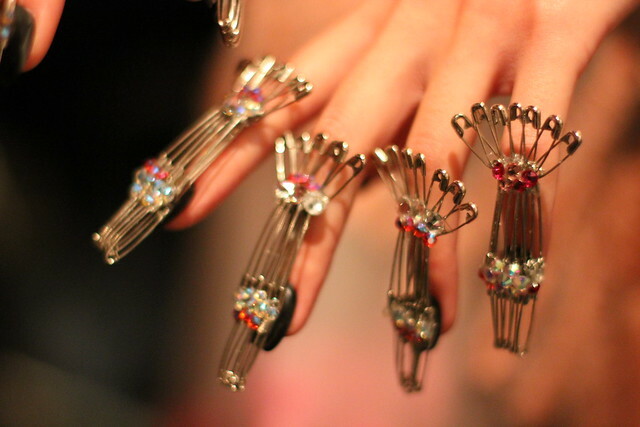 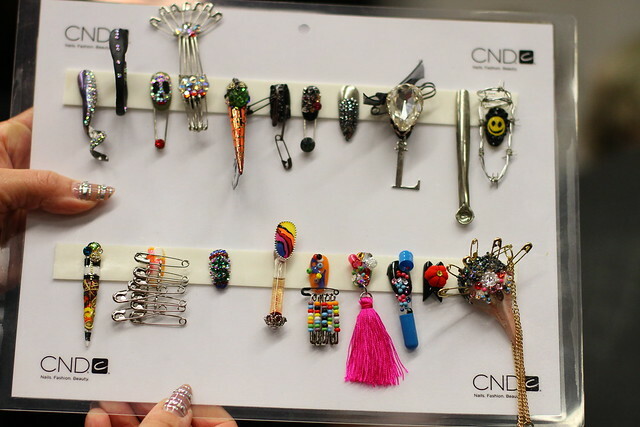 Don’t forget the rings and bracelets– some of which look like they could double as weapons!